To see all posts from my June 30, 2015 visit to the West Virginia Black Bears (this is Part Three) click HERE. To see all of the posts from my June 2015 trip through the Virginias, click HERE. To see ALL of my “On the Road” posts (going back to 2010), click HERE. 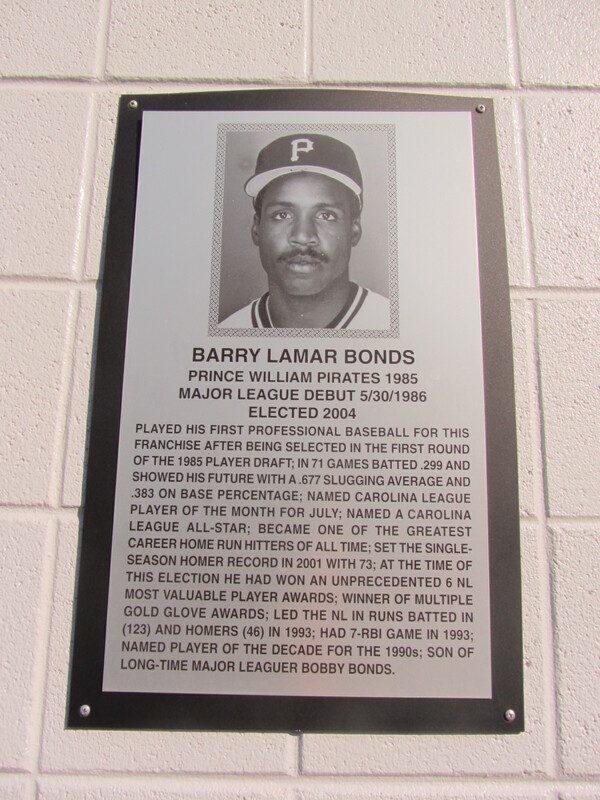 In Richmond, I used this extra pre-game time to meet with my designated eater (you know, the individual who consumes the ballpark cuisine that my gluten-free diet prohibits). 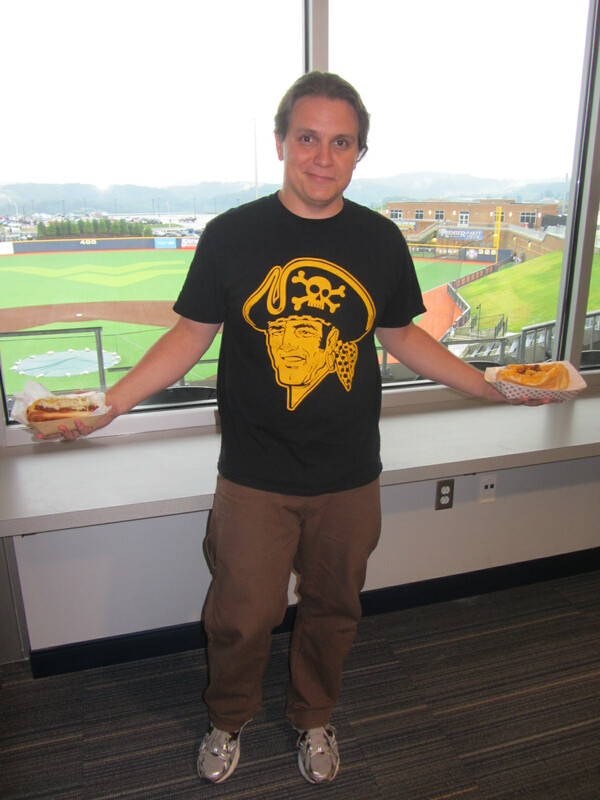 And at Monongalia County Ballpark, home of the fledgling Black Bears franchise, I did the same. My designated eater, one Mike Rensland, was an old friend of mine from the University of Pittsburgh. And, like most Pittsburghers, he travels as part of a pack. 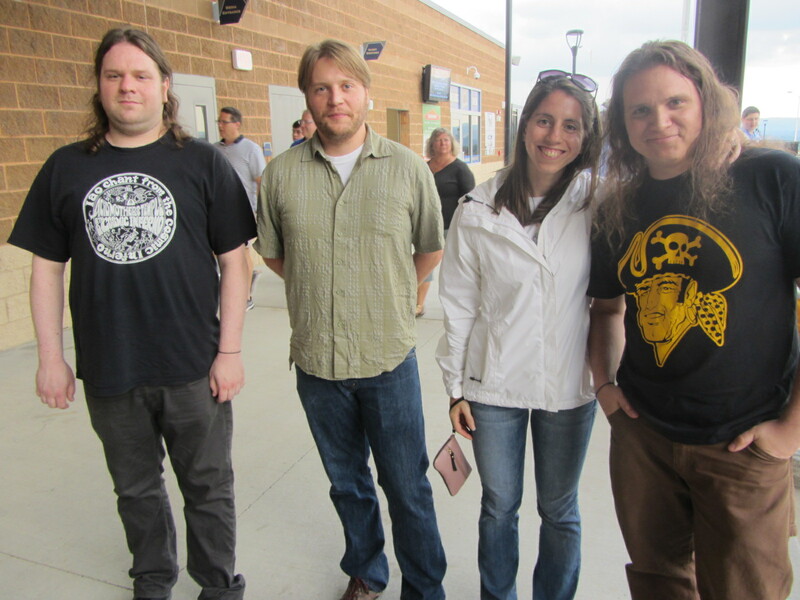 Mike’s on the far right, standing next to his wife, Julia (I almost referred to Julia as his “long-suffering” wife, just because she’s married to Mike). 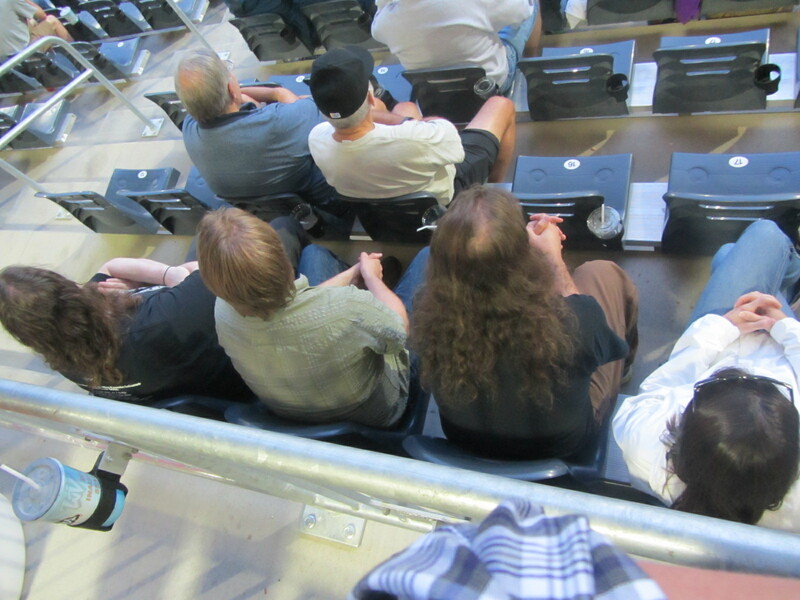 Next to them is Mike’s brother, Tim. On the far left, wearing a vintage Acid Mothers Temple “Iao Chant from the Cosmic Inferno” t-shirt, is Gary Boeh. Gary was the metal director during the time I was a DJ at 92.1 WPTS, the University of Pittsburgh radio station. (Where I was known, depending on the time slot, as Futon, Professor Murder, and Sanctimonious Jerkface). 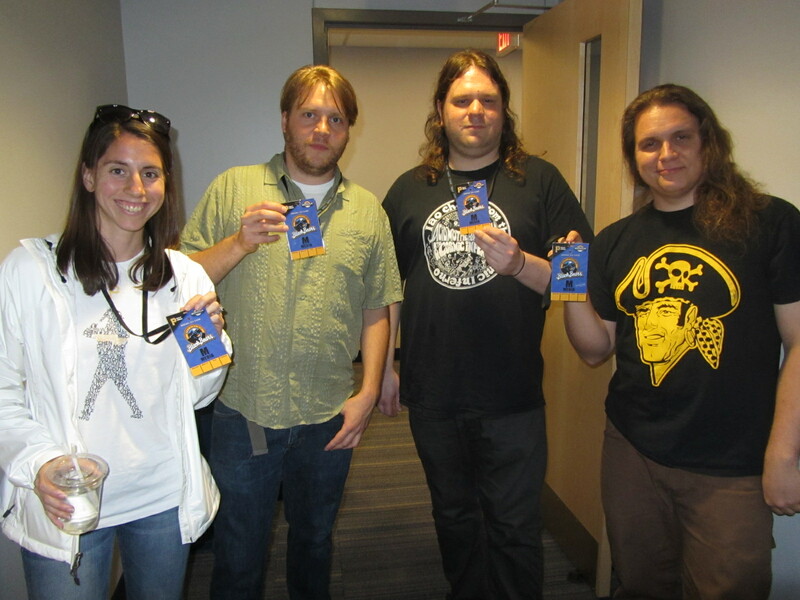 In order to get us out of the rain, Black Bears assistant general manager John Pogorzelski bestowed the above group of misfits (and Julia) with their own media passes so that we could proceed to the upper level and occupy a suite. Mike felt right at home, despite the fact that a metal pole had somehow lodged itself into his cranium. 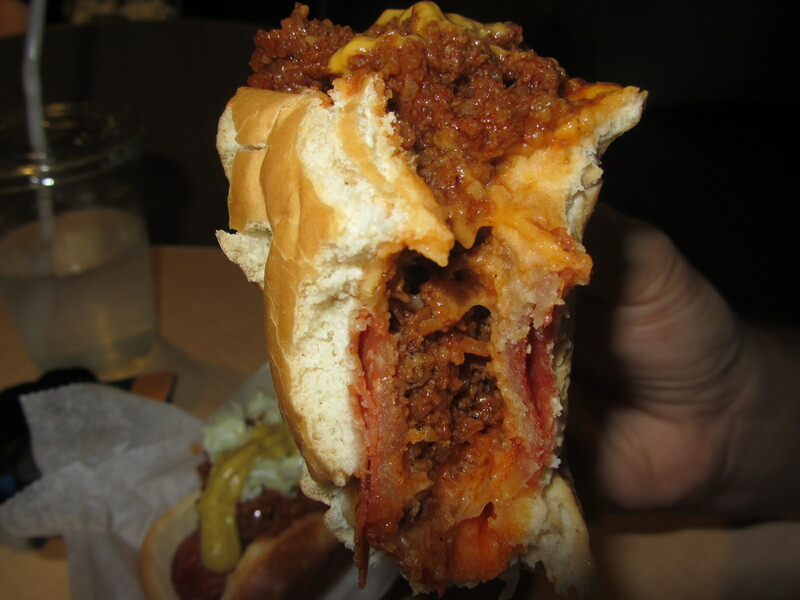 The Pepperoni Roll, long a coal miner’s lunchtime staple, is simply pepperoni baked into a roll. 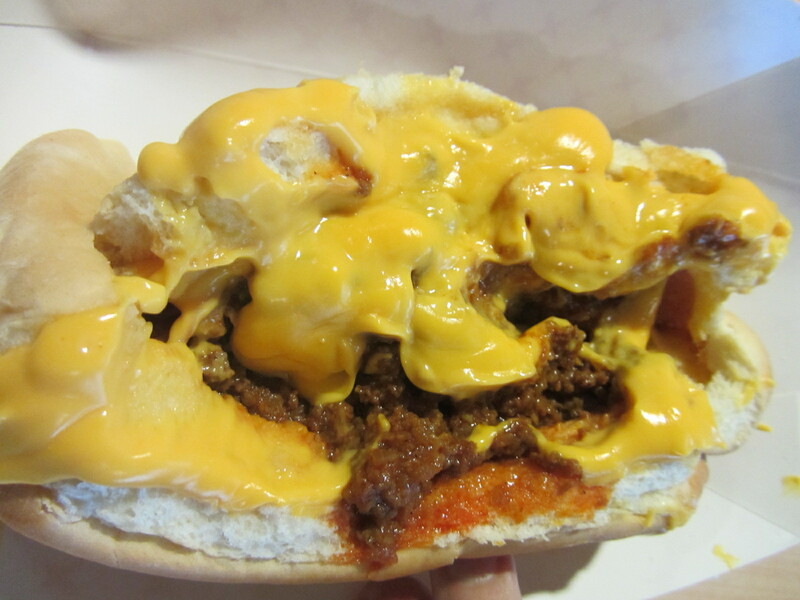 The Black Bears’ “Loaded” version is topped with chili and cheese. 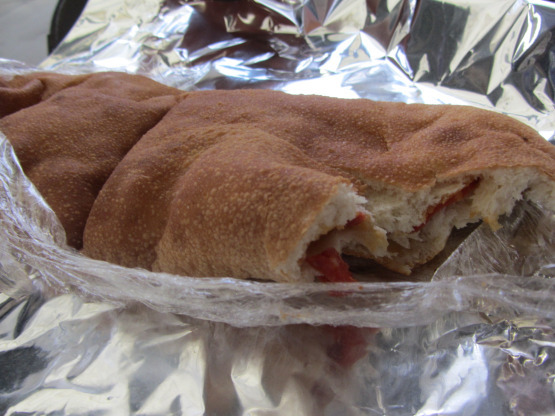 It’s a “Julia’s Pepperoni Roll,” made locally by Chico’s bakery. For comparison’s sake, this is the pepperoni roll served by West Virginia’s other Minor League Baseball entity, the West Virginia Power. Have at it, Mike, but, please, introduce yourself first. Mike wore a cutoff t-shirt bearing an indiscernible black metal band logo to his own wedding reception, but don’t let his appearance deceive you. He’s the math department chair at Urban Pathways, a charter high school located in downtown Pittsburgh. He’s been with the school since 2001, when he and I both worked there as AmeriCorps members in Pittsburgh’s KEYS (Knowledge Empowering Youth to Success) program. Some 14 years later he’s the math chair there, while I’m a niche Minor League Baseball writer based out of New York City. It’s exactly how we planned it. ‘They gave me the job two years ago, and I’m still waiting for my chair,” said Mike. Anyhow, things did not stop with the Pepperoni Roll. Mike had apparently forgotten about the hot dog he had put in that steam tray 10 minutes prior. 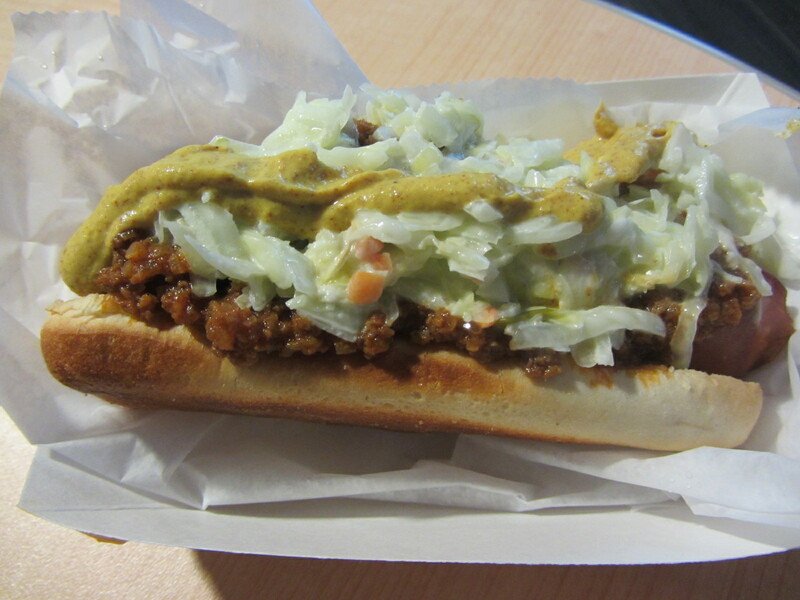 Specifically, it was the West Virginia Dog, a Farmdale frank topped with chili, coleslaw and Dijon mustard. 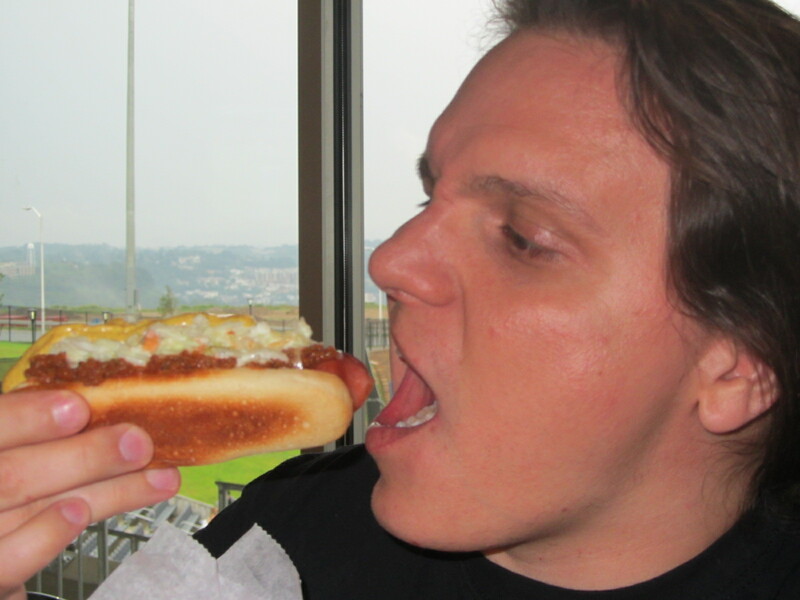 Julia had had a West Virginia Dog soon after arriving at the stadium, and she declared it “disappointing” because the “chili had no flavor to it.” Now it was Mike’s turn to give it a try. “It’s not bad,” said Mike. “See, I told you you’d be disappointed,” replied Julia, choosing to interpret Mike’s ambivalence as disappointment. Mike then made a punching motion. 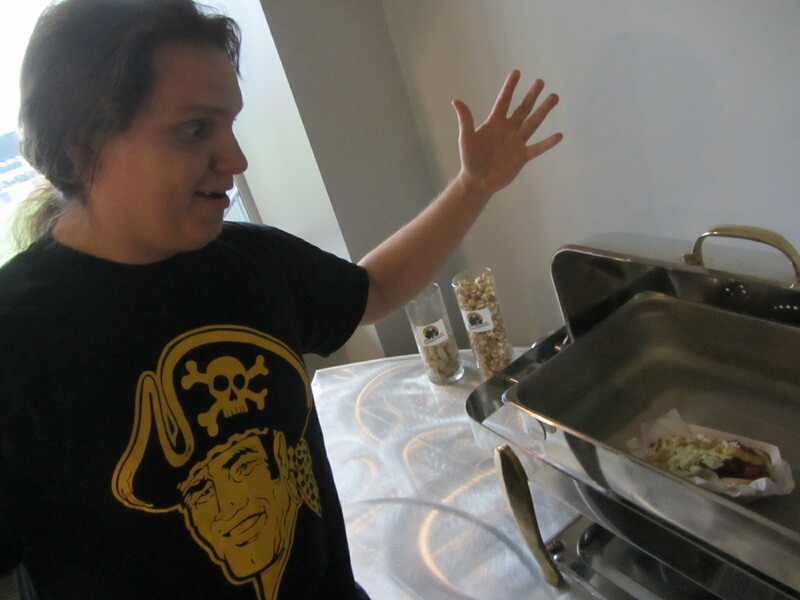 An order of nachos had made their way up to the suite as well, which were standard-issue ballpark nachos. 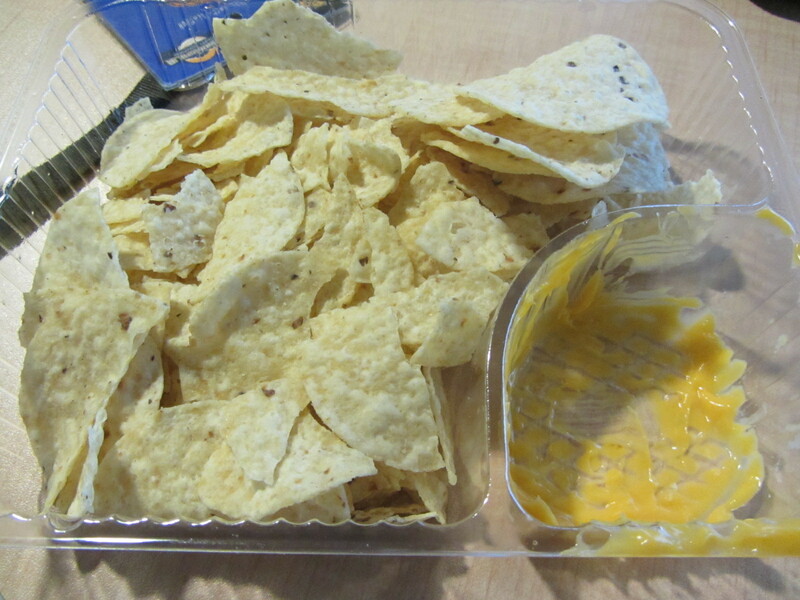 It was frustrating, however, that the cheese supply was diminished when there were so many chips left. This is a common lament of the nacho enthusiast, and I believe that teams across Minor League Baseball need to take steps to rectify this problem. Actually, they need to take just one step: Provide more cheese. Our brief suite-based food tour ended on a high note, however. Bear Claws. 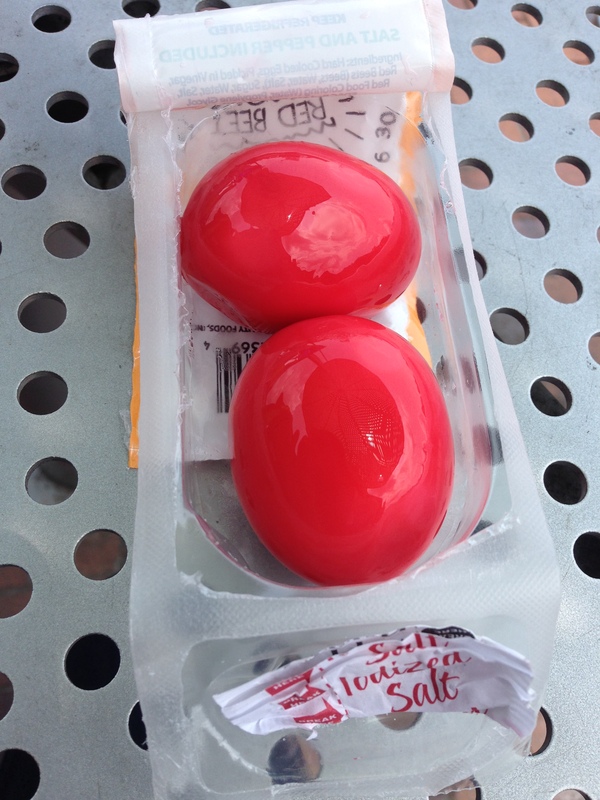 stuffed with a sugar, butter and almond extract filling, had been obtained from a concourse-level kiosk. Each Bear Claw comes with a bowl of ice cream. “But what do they do with the rest of the bear?” pondered Mike. The Bear Claws were met with a chorus of approbation, loved by all four individuals who tried them. 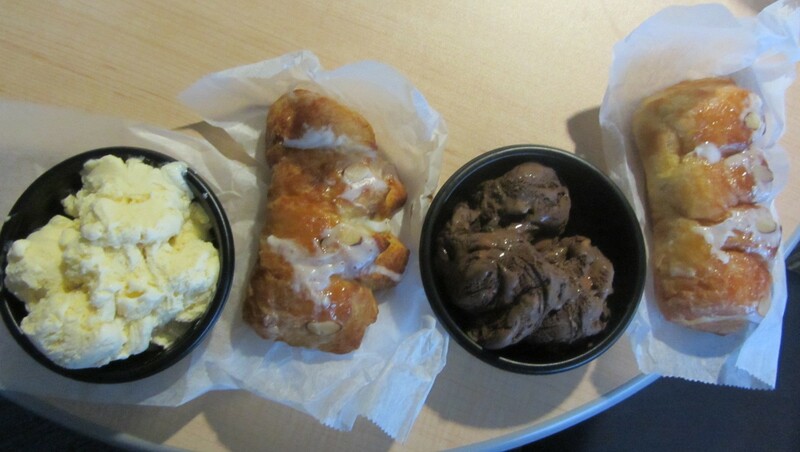 “The ice cream wets you up, and the bear claw dries you back up,” stated Mike. 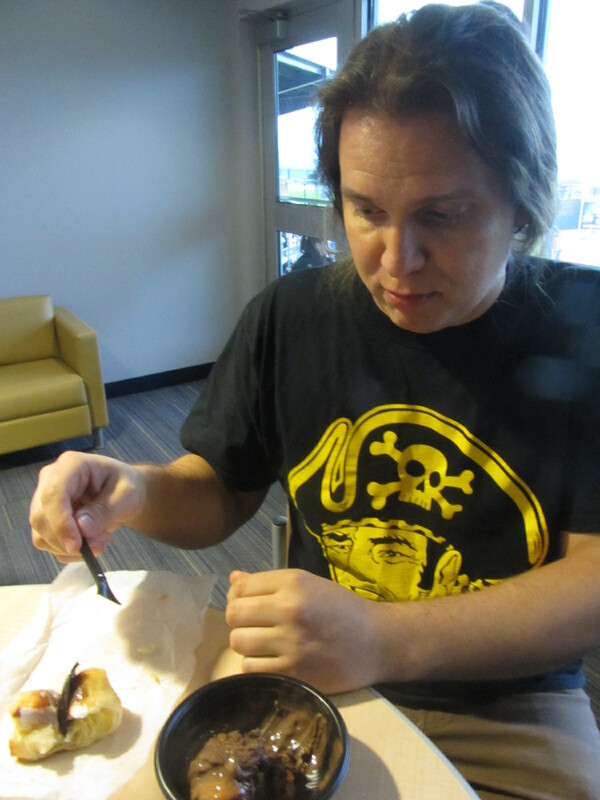 The only downside was Mike’s cutlery snafu, as a plastic spoon is clearly no match for a bear claw. And that’ll do it for Mike and company’s designated eating adventure. If you, for some reason, just can’t get enough of Mike, then check out his band Night Vapor. “It’s music for the mentally ill,” he said. The “media” members seen above soon ended their charade, turning their badges in to guest services and returning to their seats just in time for the start of the game. To see all posts from my June 30, 2015 visit to the West Virginia Black Bears (this is Part Two) click HERE. To see all of the posts from my June 2015 trip through the Virginias, click HERE. To see ALL of my “On the Road” posts (going back to 2010), click HERE. 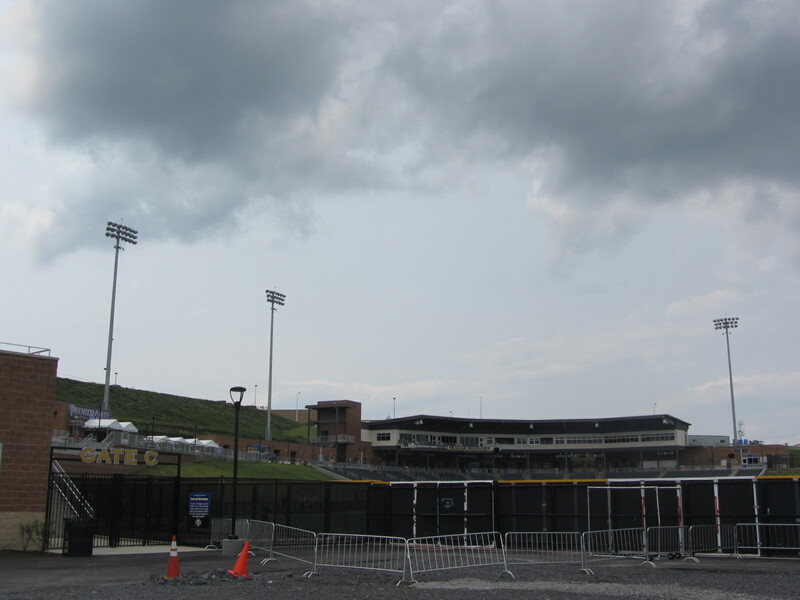 When the previous installment of this West Virginia Black Bears narrative concluded — in a post that ran back on July 28, covering a game that took place on June 30 — the rains had come and that evening’s scheduled contest against the Mahoning Valley Scrappers was in a delay. This installment, then, begins when the rain had passed. 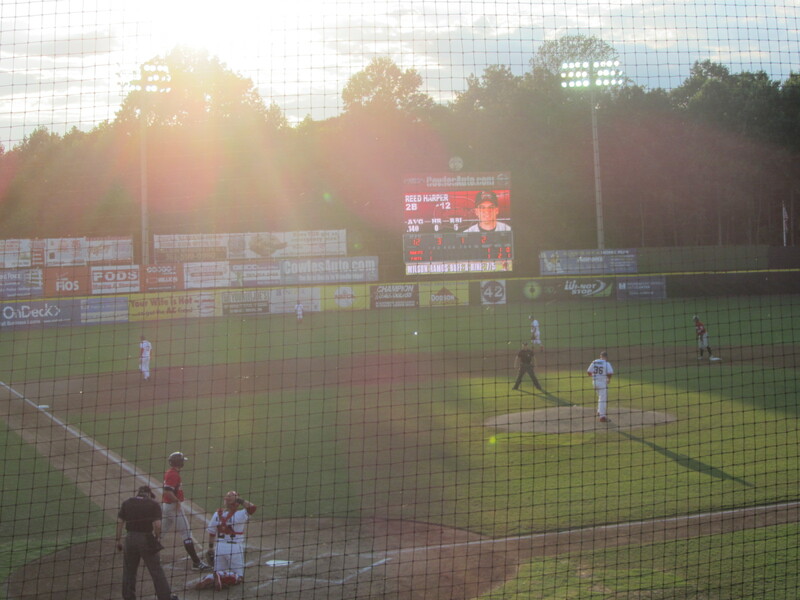 After a 79-minute delay, it was now time for some New York-Penn League Baseball. I had been told that West Virginians were a hardy breed, so I was therefore a bit surprised that so many ticket-holding fans either left during the delay or never showed up at all. This was just the sixth game in franchise history, why not wait it out? Weren’t you just excited to be there? At the very least there was plenty of time to wander around the concourse and get a nice sense of a brand-new ballpark. Anyhow, those fans that did remain were treated to an excellent rendition of our National Anthem. And, then, a ballgame began. It is the way of things. 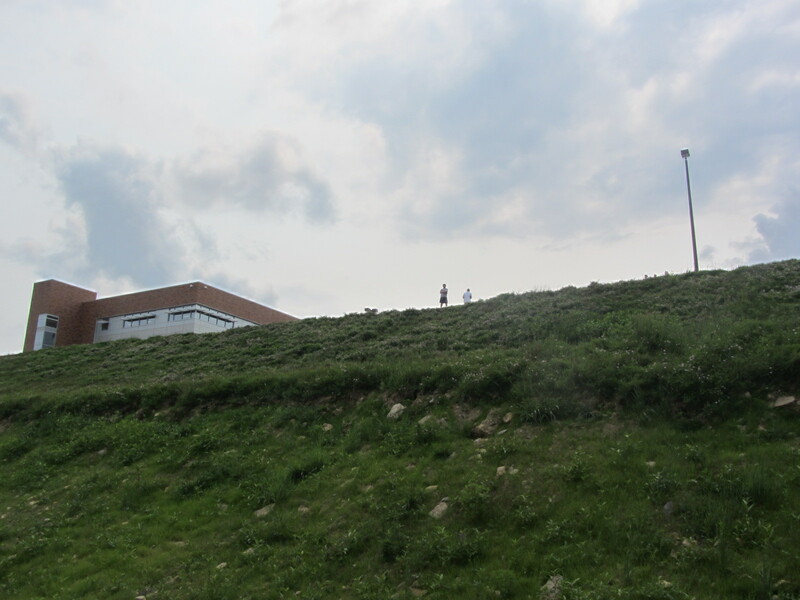 Playing ball is one thing, but retrieving them from the too-steep-for-fan-habitation berm area is not allowed. 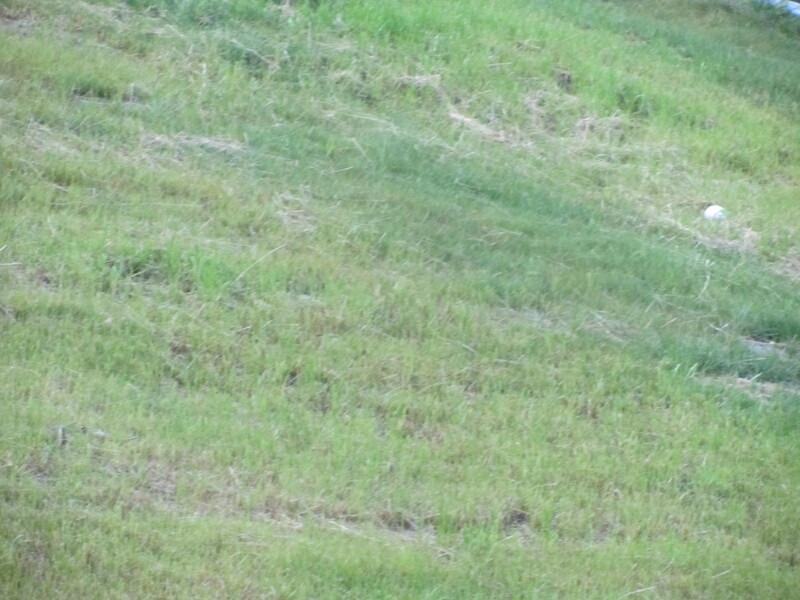 Throughout the ballgame, one can spot tantalizing yet unobtainable Easter eggs nestled within the grass. 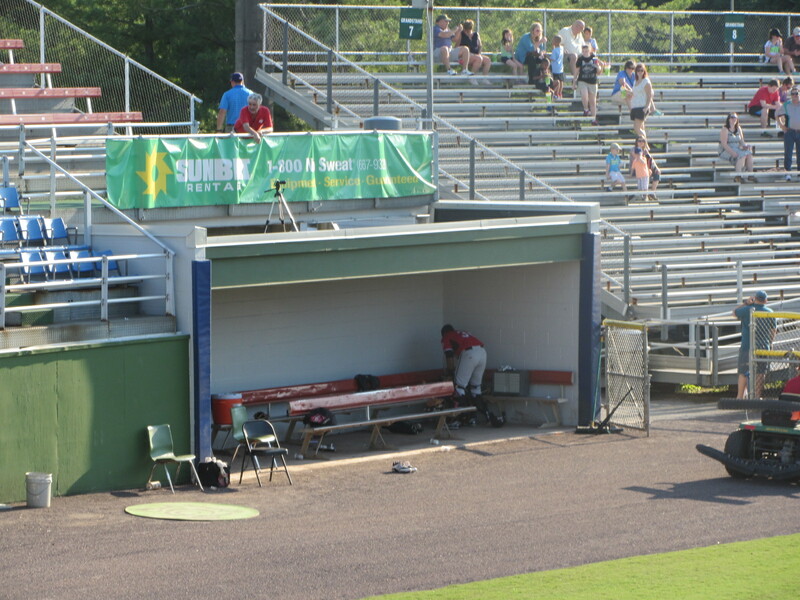 The berm area also provides on-field access for those taking part in between-inning contests. 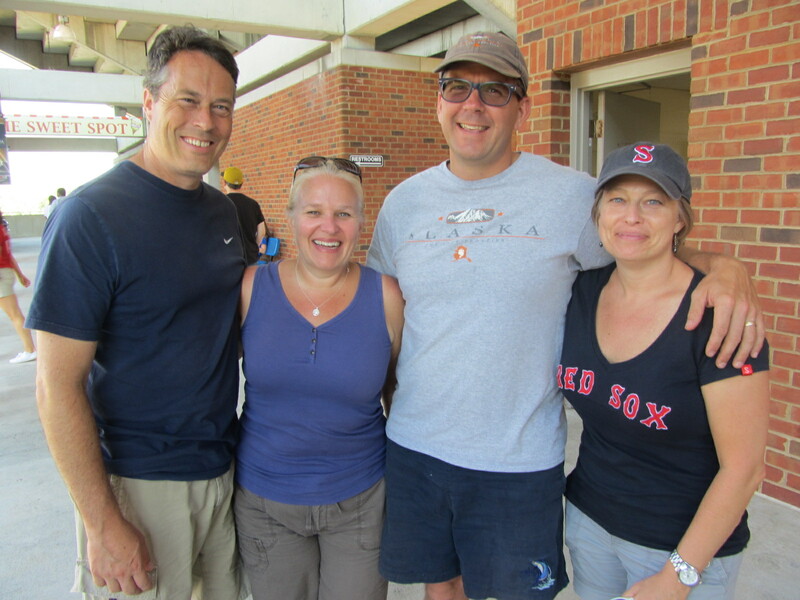 On this evening, those taking part in the between-inning festivities included Mike and Tim Rensland. The Renslands are old friends of mine, dating back to our University of Pittsburgh days. We kept our Pitt connections secret, given that we were in the heart of WVU territory, and this reminds me: the name of the on-field emcee was Caroline, which is a dangerous name to have when you’re in the heart of WVU territory. You will never hear “Sweet Caroline” play at a Black Bears game, that’s for sure. For more specifics on all of this, do a Google search. I do not traffic in profanity. Another old pal of mine, former WPTS metal director Gary Boeh, declined to participate in the dance-off shown above. However! He did consent to being filmed performing his approximation of Chris Elliot’s Alley Cat dance while wearing his finest Acid Mothers Temple t-shirt. Characters abounded on this evening. For reasons that made sense at the time, I made my acquaintance with an amiable turtle. I later rendezvoused with Cooper in this right field corner location. Like all rendezvous, this one happened for a good reason. 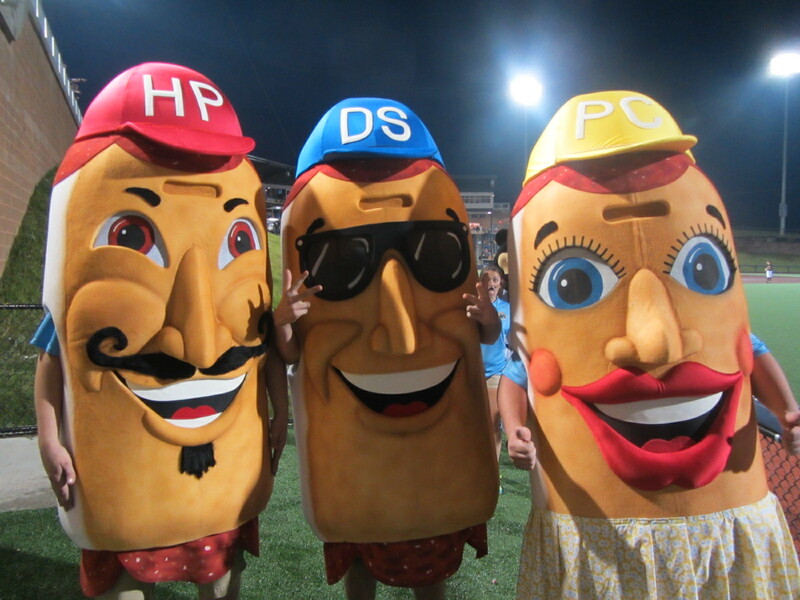 We were there to watch the Pepperoni Roll Race, in which Hot Pepper Hank, Double-Stuffed Dave and Pepperoni and Cheese Patty race across the outfield. (If you don’t know what a Pepperoni Roll is, then just wait until the next blog post). It was a very uninspired race, as this triumvirate of pepperoni rolls was clearly suffering from a case of post-rain delay lethargy. Nonetheless, they were gracious enough to pose for a picture. 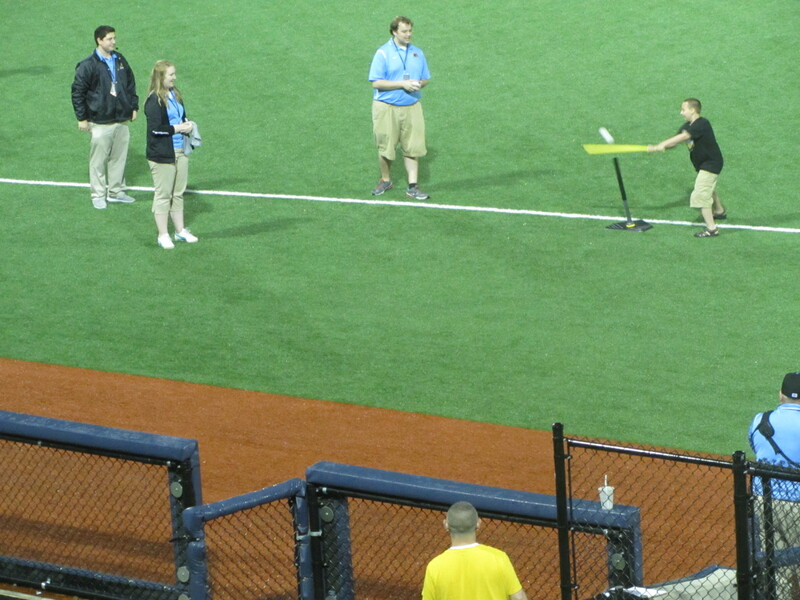 Later, a young fan hit some balls into the stands. And, later still, fans were treated to a race inspired by WVU’s transportation system. With the game winding down, I stopped into the “Bear’s Den” team store. A woman named Penny was working the register, and here’s the thing about Penny: she’s the mother of current San Diego Padre Jedd Gyorko. The Gyorko family is from this area, and Jedd went on to become one of the best players in WVU history. 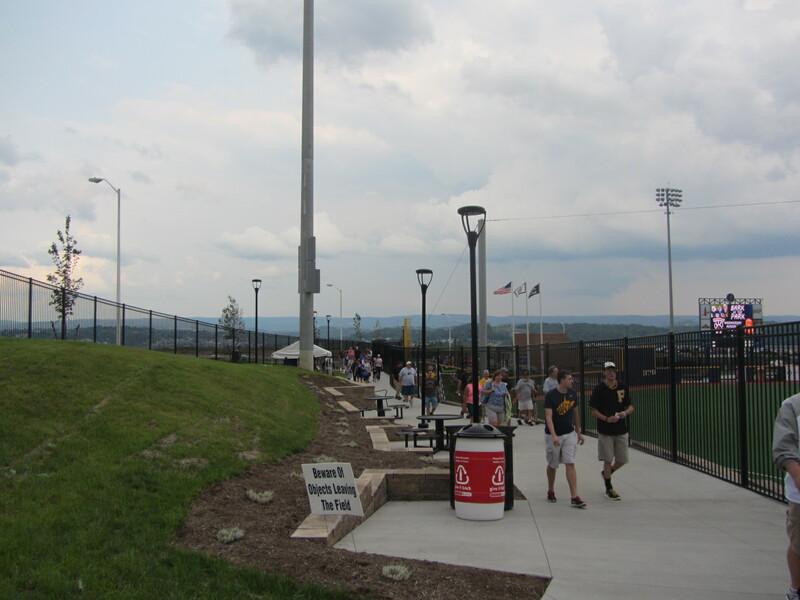 Monongalia County Ballpark is even located on “Gyorko Drive,” an homage to Jedd’s sporting success and a re-christening so fresh that it probably isn’t yet showing up in your GPS device of choice. I thought that an interview with Penny, regarding her life in and around baseball, could result in an interesting MiLB.com story. She (very politely) declined, however, marking only the second time this season I’ve been rejected. I’ve still got a pretty good batting average on this front, all things considered. 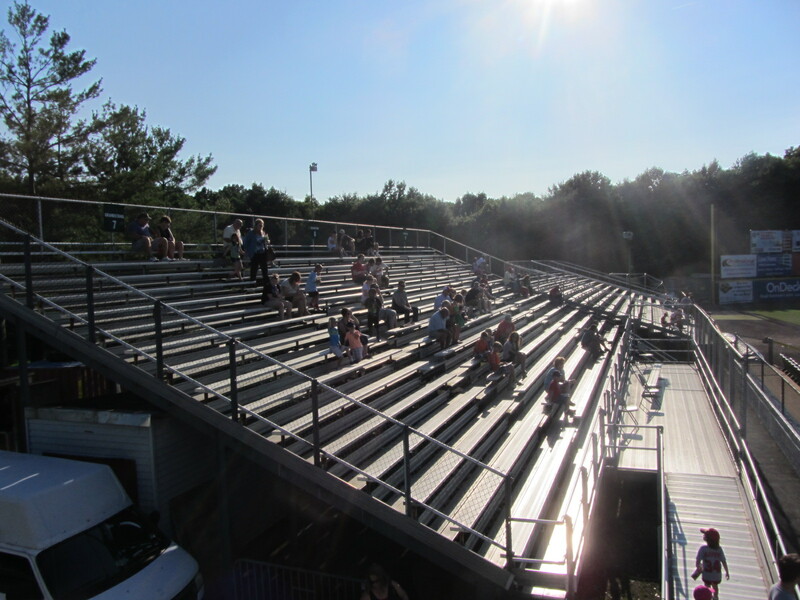 Meanwhile, the evening’s game between the Black Bears and visiting Hudson Valley Renegades was winding down. The one thing I remember about this contest, as regards the action on the field, is that the players were starting their slides very early and still overshooting the base. That artificial turf is slicker than it looks. 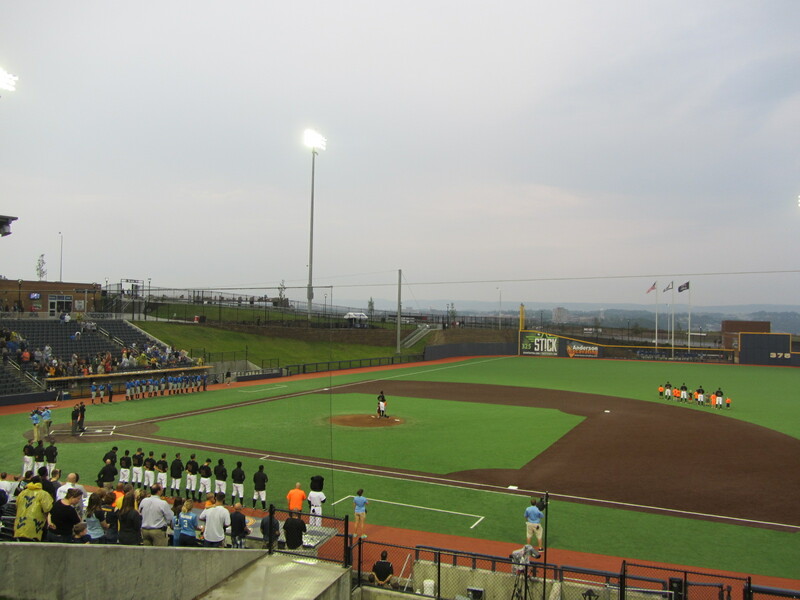 And that was all she wrote from Monongalia County Ballpark, a Black Bears victory finished in front of a crowd announced at just 1,718. 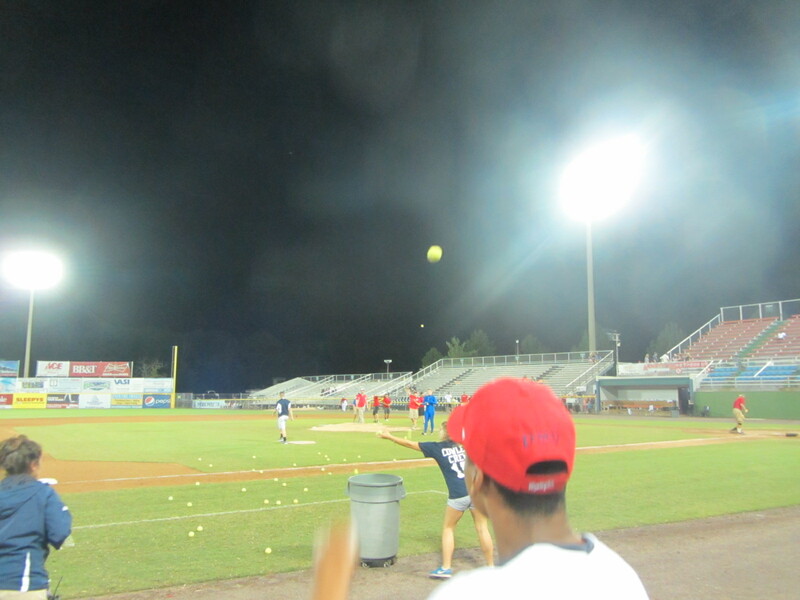 By the time the game ended the night was cold, the grounds were wet and the energy was low. But it’s important to remember that the day, way back when, had started out beautifully. And that this is a beautiful place. 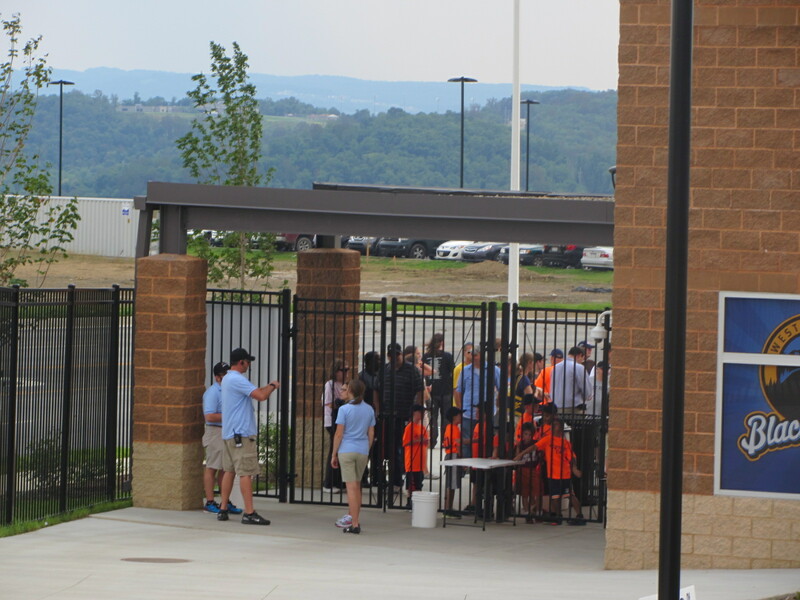 To see all posts from my June 30, 2015 visit to the West Virginia Black Bears (this is Part One) click HERE. To see all of the posts from my June 2015 trip through the Virginias, click HERE. To see ALL of my “On the Road” posts (going back to 2010), click HERE. The reason that I dubbed this road trip “Virginias 2015” — as opposed to “Virginia 2015 — was because it did indeed contain multiple Virginias. But the singular did not become multiple until the very last day of the trip, when I crossed the state line from Virginia into Maryland and then into the other Virginia. 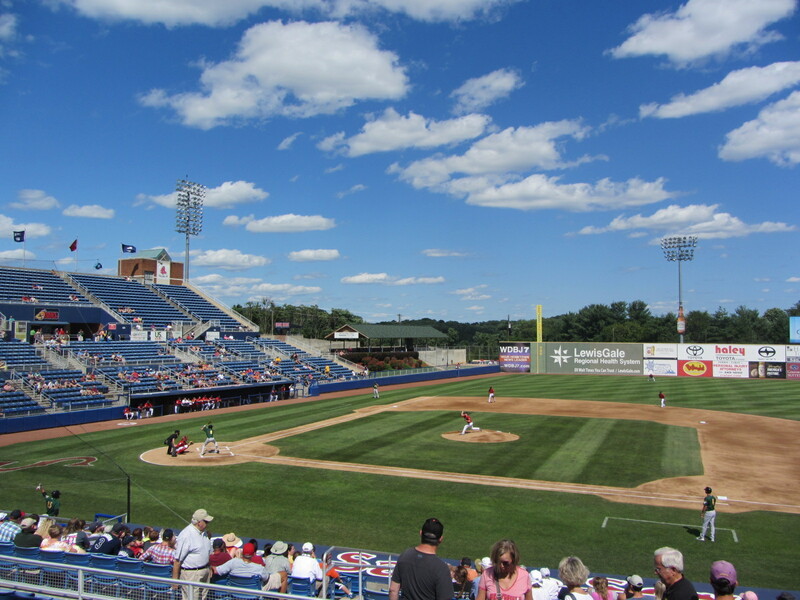 Over the last two decades, the New York-Penn League has expanded far beyond the two states in its name. 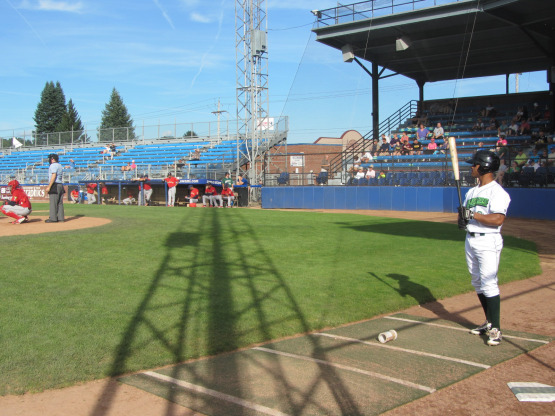 The Class A Short Season circuit currently has franchises in Connecticut, Maryland, Massachusetts, Ohio, Vermont and, as of last month, West Virginia. 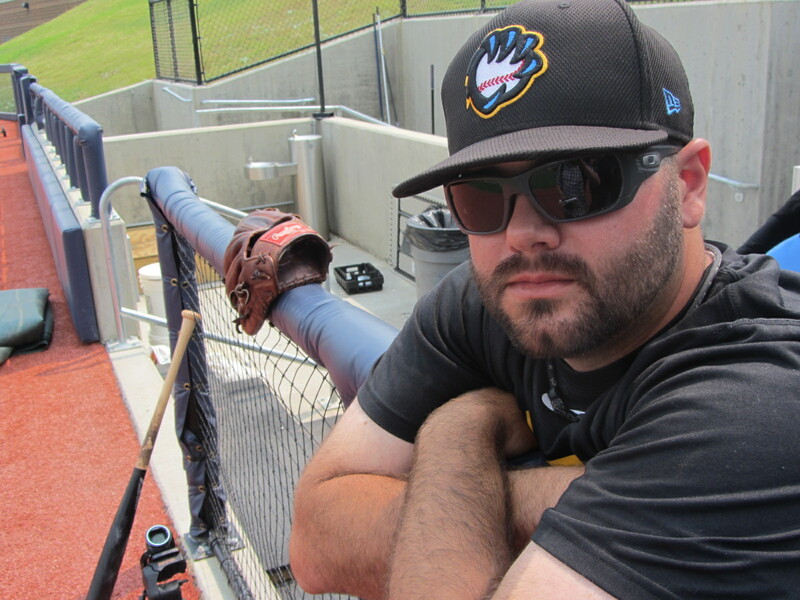 The NYPL’s first Mountain State entrant, which relocated from Jamestown, New York, has dubbed itself the West Virginia Black Bears. Specifically, the Black Bears represent the north-central metropolis of Morgantown and the surrounding community. 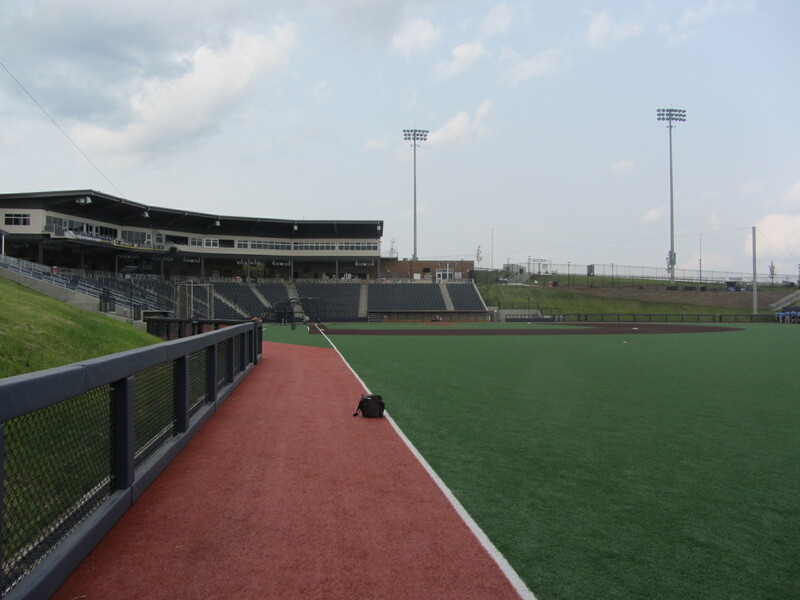 Monongalia County Stadium, the team’s brand-new facility, is shared with West Virginia University’s Big 12 baseball program. 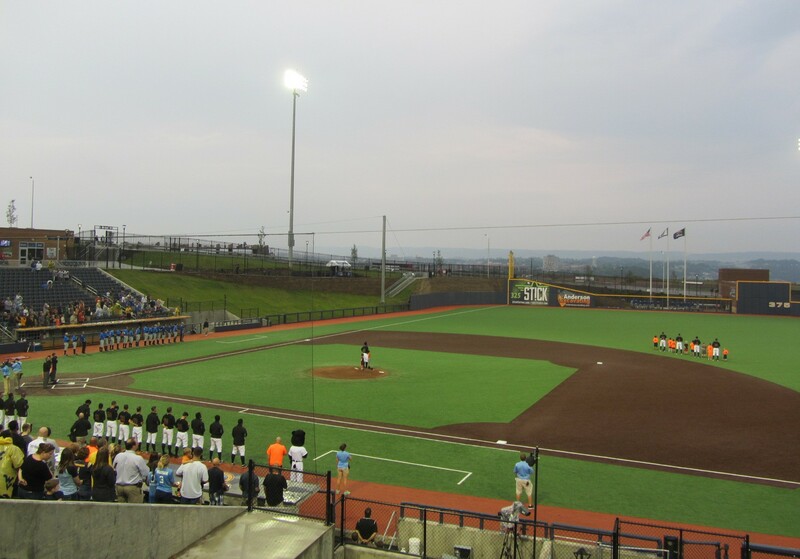 The Black Bears, a Pirates affiliate, played their first game there on June 19. The stadium is located on “Gyorko Drive,” named after local-baseball-hero-turned-San Diego Padre-Jedd Gyorko. “Gyorko Drive” isn’t on any maps yet and will probably not appear in your GPS device of choice. Your best bet is to set your coordinates for the Wal-Mart on University Town Centre Drive (in Granville, not Morgantown) and then just keep on driving right past the Wal-Mart (as it is always best to do). 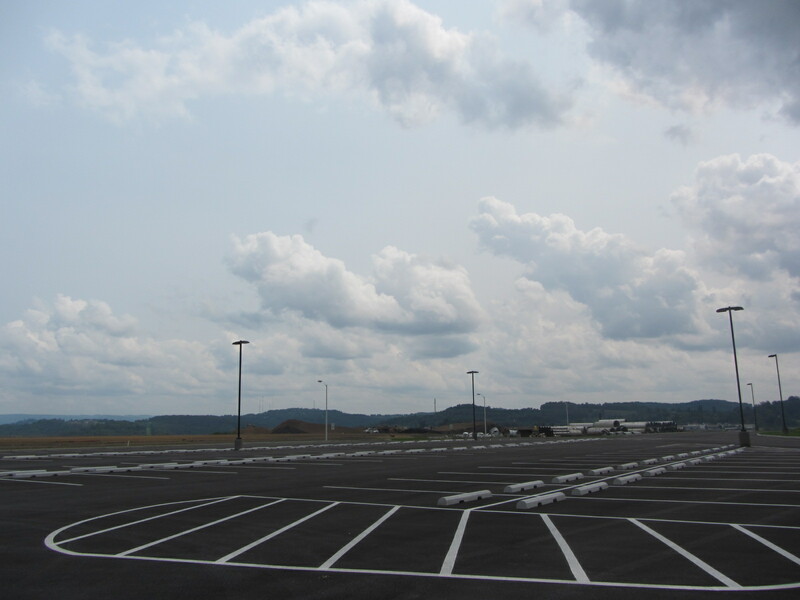 Eventually, you’ll make it to Monongalia County Stadium. This was my first view of the stadium. Many superior views were to follow, but you never forget your first. 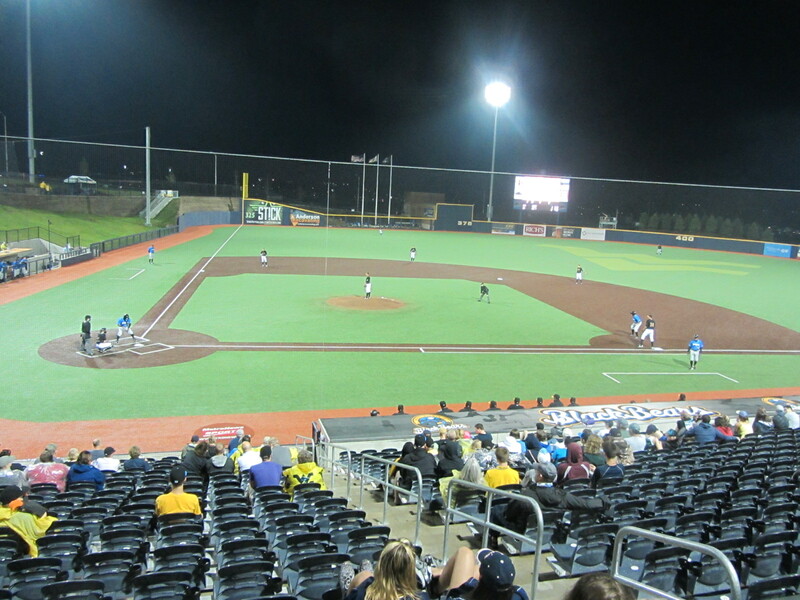 Monongalia County Ballpark is located not in Morgantown but to the northwest in the comparatively miniscule town of Granville (pop. 2,508). 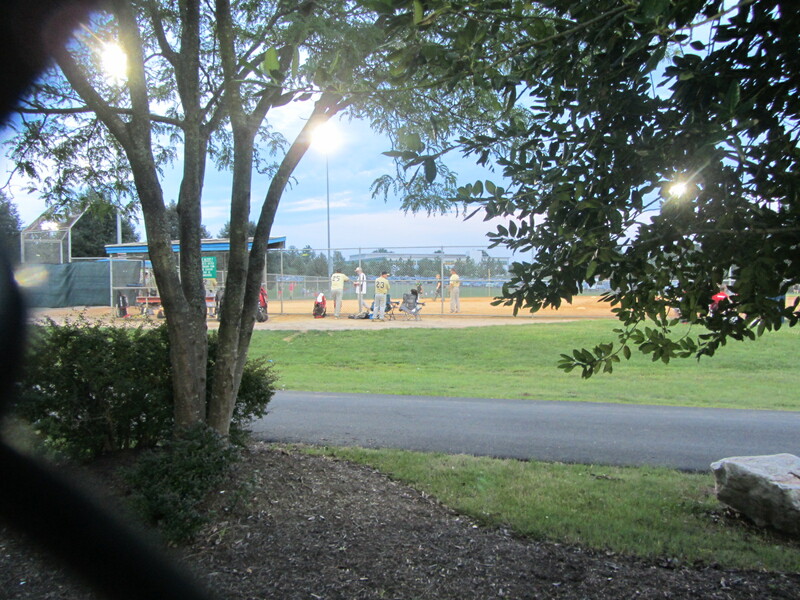 The area in which the ballpark is located used to be coal mining country. It is currently surrounded by, well, not much. Change is imminent. Granville’s University Town Centre — a sprawling assemblage of chain stores, restaurants and hotels — is located en route to the ballpark, and similar development is planned in the area surrounding the park. 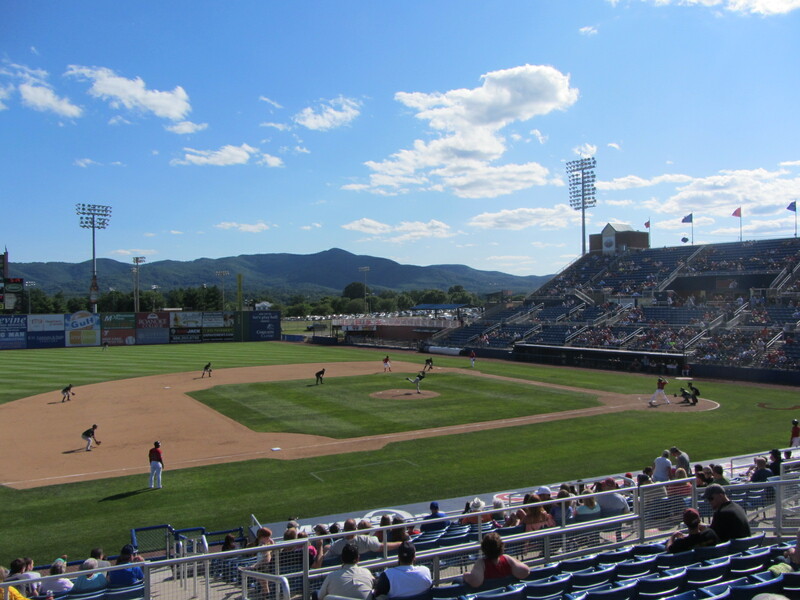 Black Bears assistant general manager John Pogorzelski said that there will soon be a new Route 79 off-ramp close to the stadium to accommodate the traffic generated by the new hotels, stores and, of course, baseball fans. Pogorzelski — whom I will henceforth call “John” — gave me a tour of the facility. 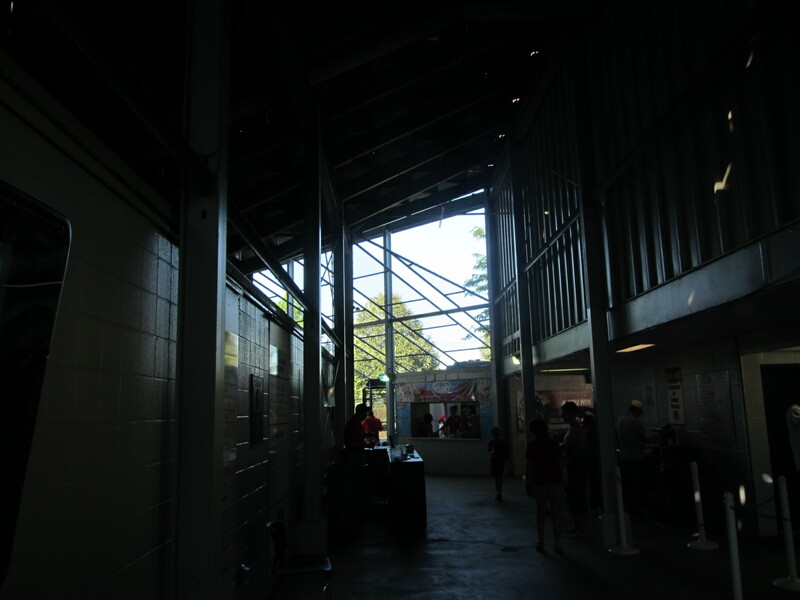 We began by entering the external structure located beyond right field (to the left of Gate C). The smell of paint permeated the area, resulting in a visceral reminder that this ballpark is still very, very new. 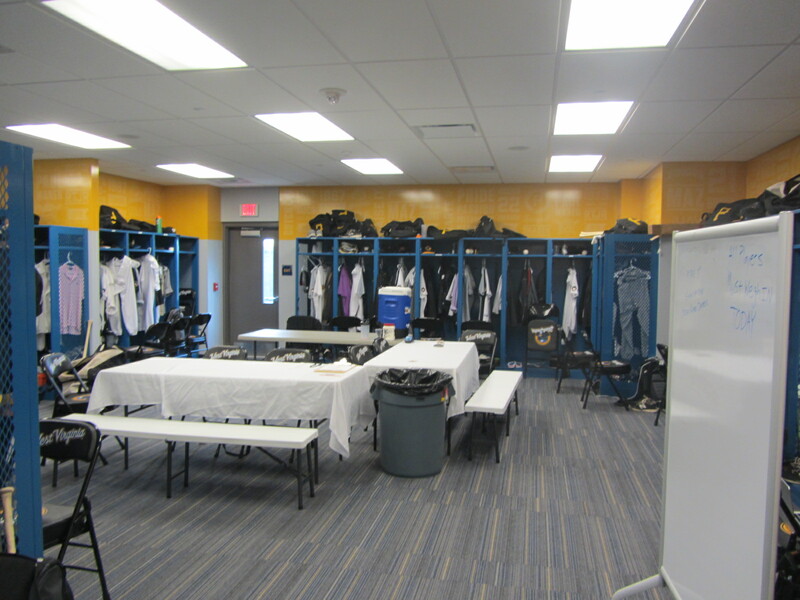 Here’s the home clubhouse, which is pretty small for a new stadium. Nonetheless, when we walked by, there was some ping pong-table acquisition chatter going on inside. There’s always room for ping-pong. 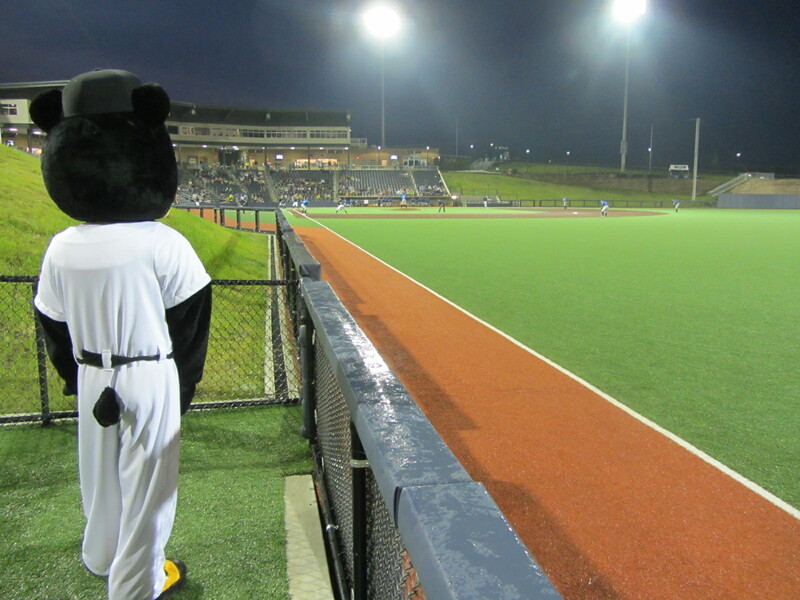 The vast majority of the ballpark’s Black Bear population was out on the field, vigorously exercising thigh muscle. As you may have inferred from the above photo (but probably didn’t) the entire field (save for the clay pitcher’s mound) is artificial turf. 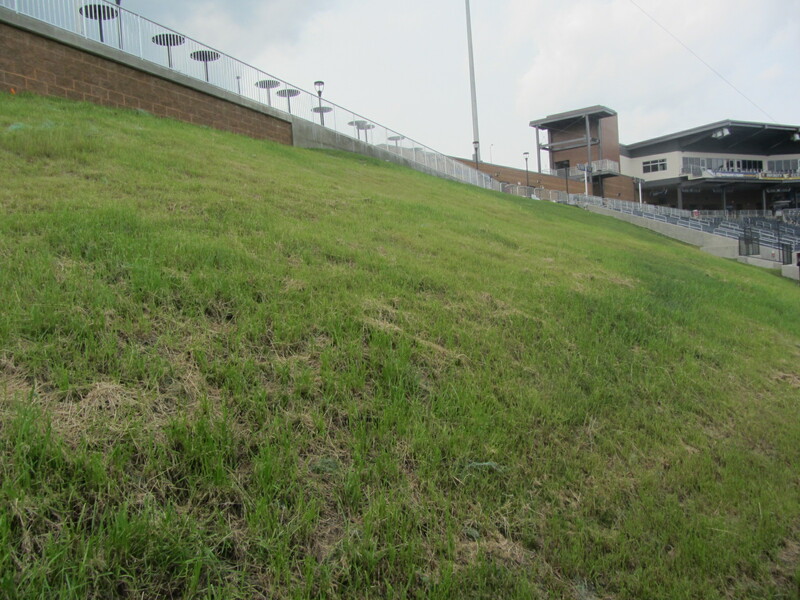 The berm area is real grass, but the berm area (on both sides of the ballpark) is not yet open to fans because the hills are so steep. 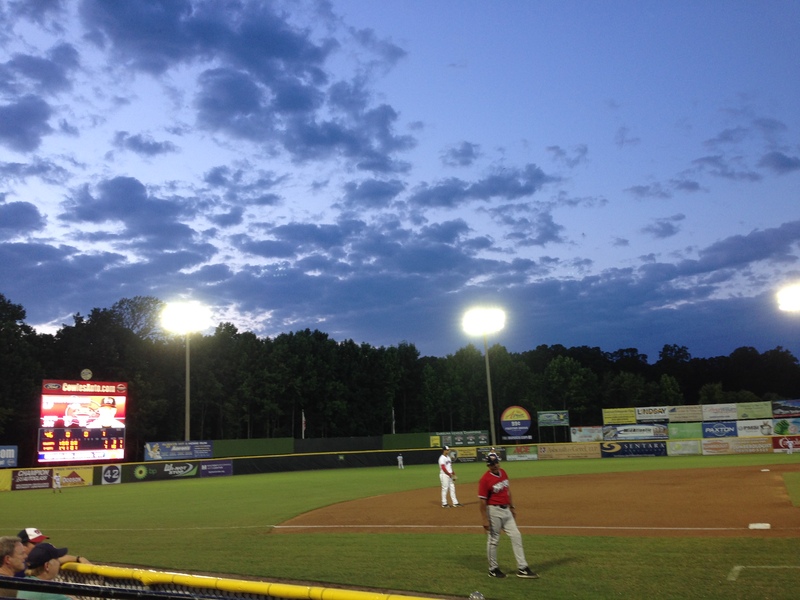 This is a very Hill-y ballpark, even on days in which I am not there. 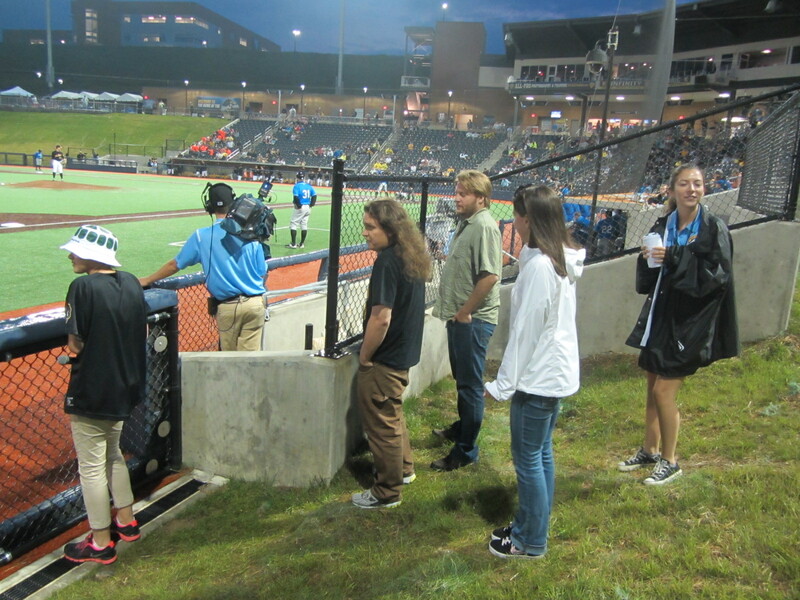 The Black Bears might compete on artificial turf, but they nonetheless have (and need) a groundskeeper. His name is Craig McIntosh. 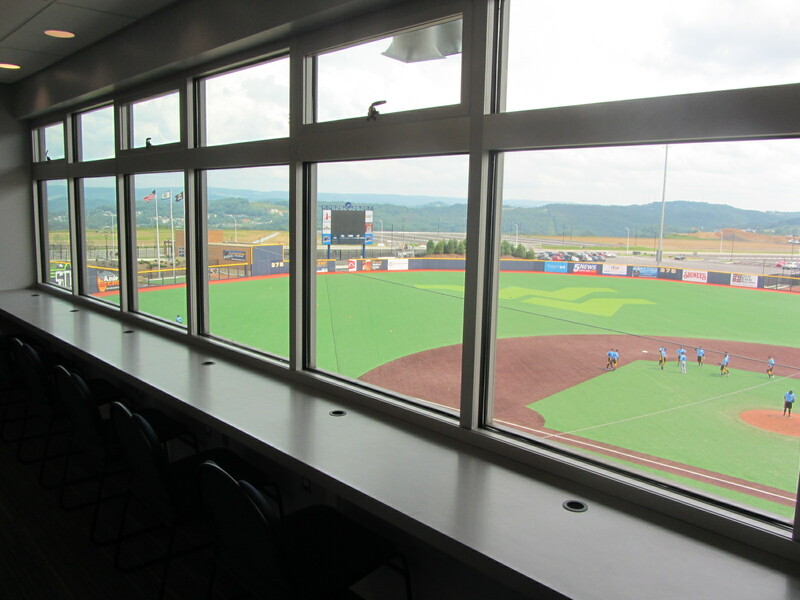 Monongalia County Ballpark has only 2500 fixed seats. There are no arm rests, at least for now, with John explaining that the initial choice was between arm rests and cup holders. “We figured that people would need a place to hold their beer,” he said. 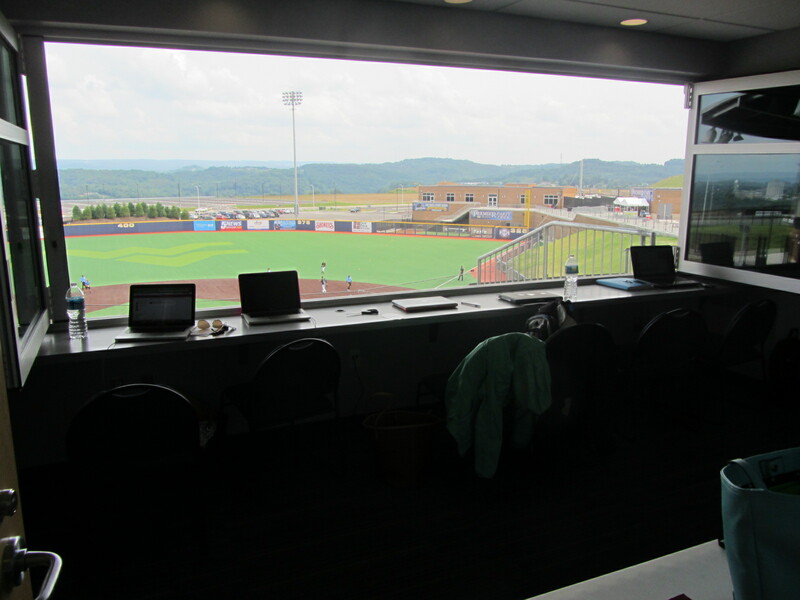 We then walked up the stairs to the press box and suite level, which provides the best example of what is this ballpark’s best feature: The View. Once again, I’m going to dip my blogging ladle into the supple pre-existing MiLB.com article well. 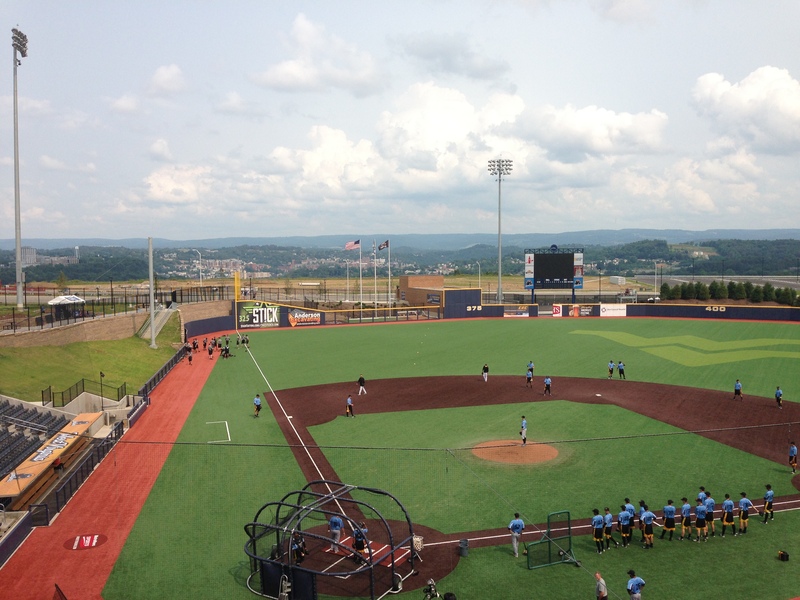 The unique topography of Monongalia County Ballpark makes for a somewhat awkward layout, but any minor inconveniences are made up for — and then some — by what is one of the best views in Minor League Baseball. 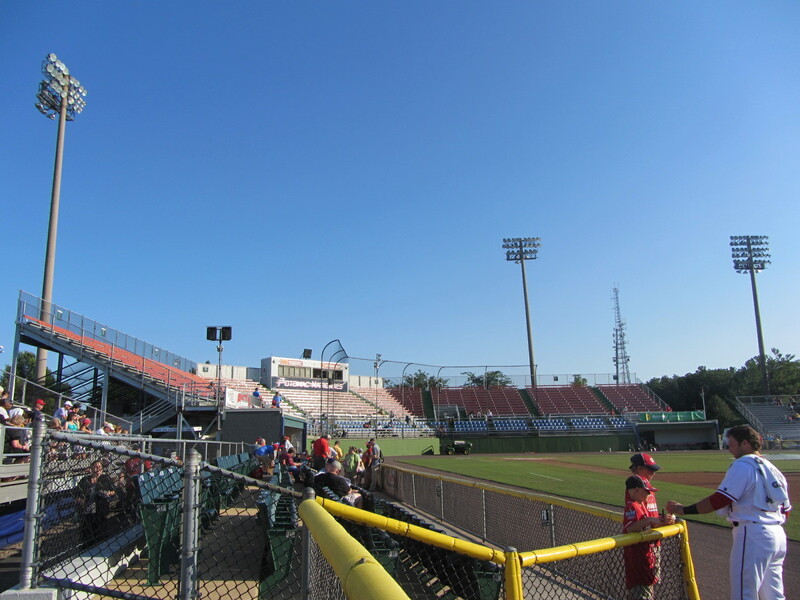 The ballpark faces to the southeast. 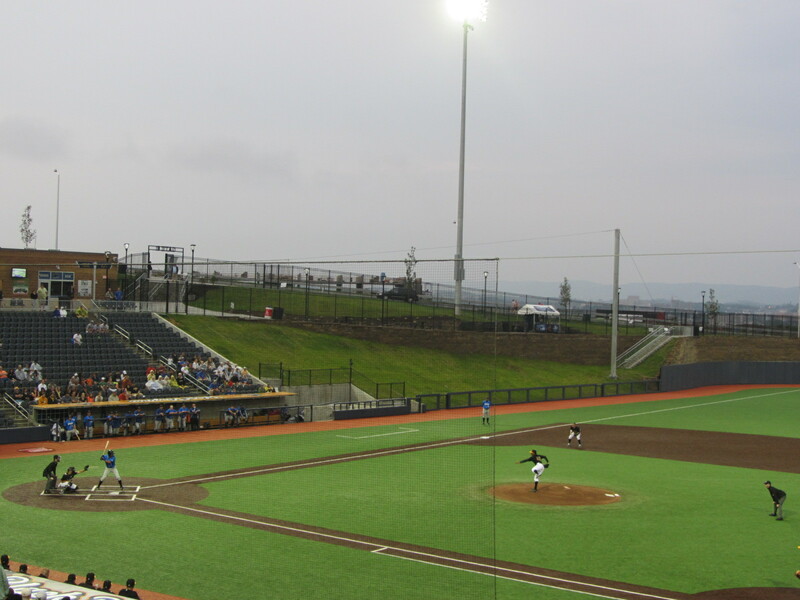 That’s downtown Morgantown beyond left field (in both foul and fair territory), which gives way to the smaller town of Westover and, most prominently, the natural beauty which lays beyond the winding Monongahela River (not visible from the ballpark). There’s a reason that WVU’s sports teams are called “Mountaineers,” and, of course, within those mountains one can find black bears. 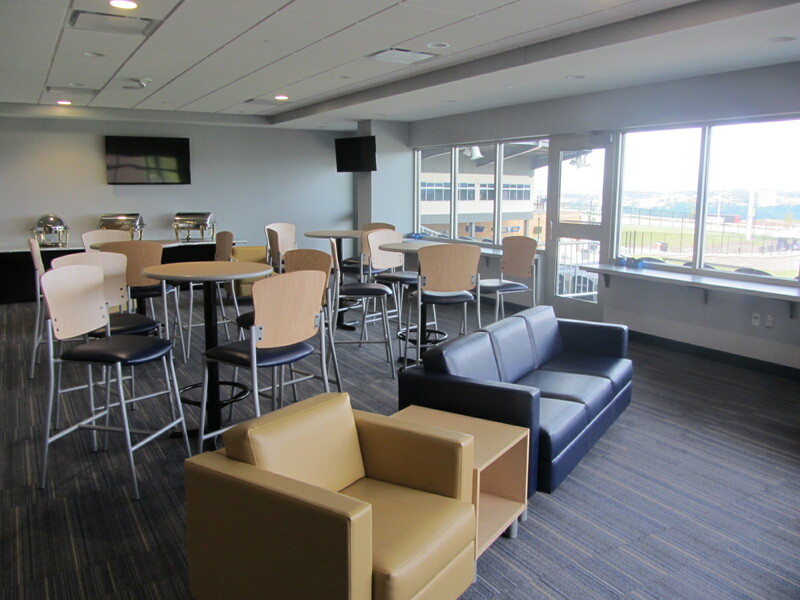 There are three suites, one of them being this 50-person group area. 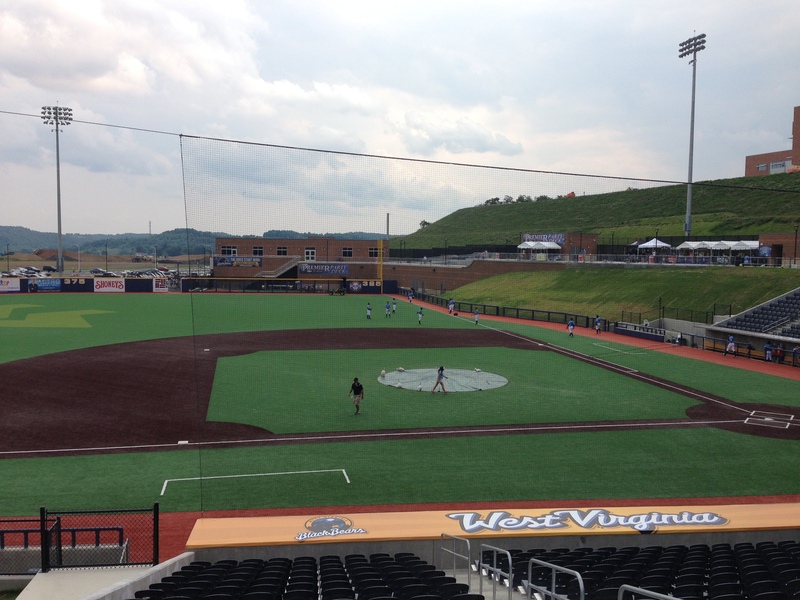 Behind the ballpark, on the first base side, is a WVU-affiliated medical facility. I guess, if you really wanted to, you could watch the game from here for free. You could also take a terrifying tumble into the abyss, if you’re not careful. 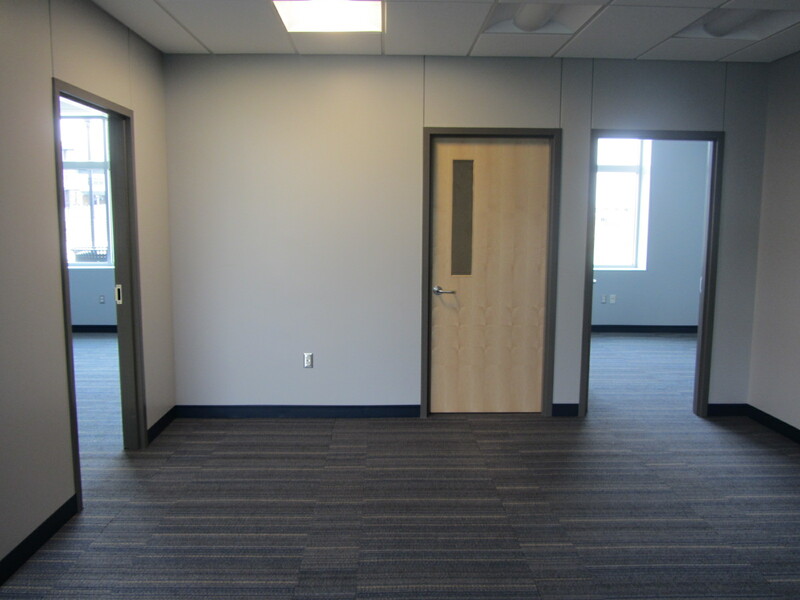 At the time that I visited, the Black Bears front office had not yet moved into what will be their office. Like the player locker rooms, I was surprised at the relative smallness of the offices. Generally, new ballparks are more expansive. As we got closer to the start of the game, fans started gathering outside the main gate. 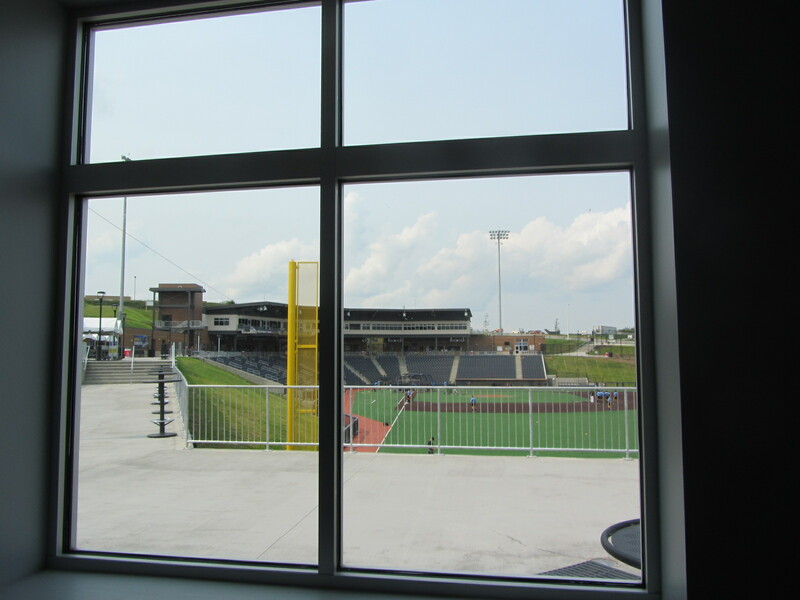 The home plate side of Monogalia County Ballpark is built up against a hill, and as such there is no home plate entry into the ballpark. This leads to a unique feature in that the main entrance, Gate A, is located in left-center field. 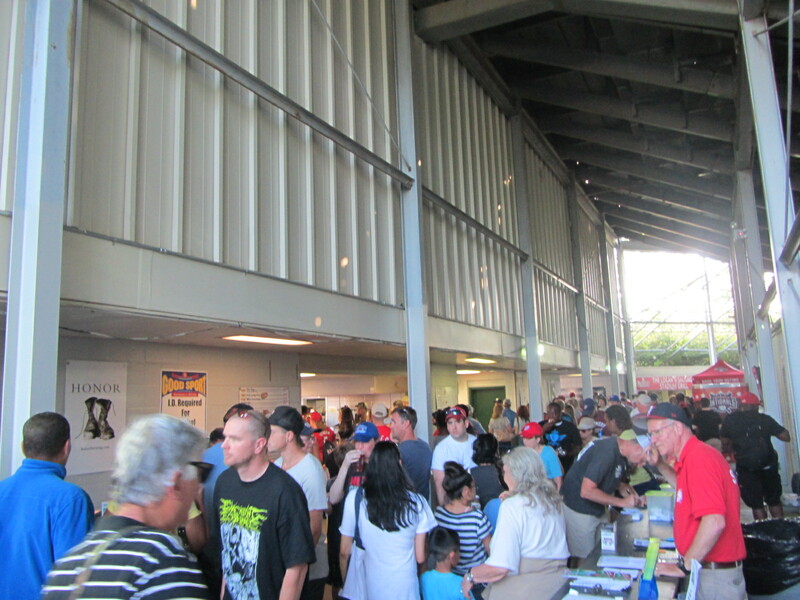 Fans entering through the gate then embark on (what should be) a leisurely walk down the third base concourse to the seating area behind home plate. Another ballpark, another rain delay. Thus is life on the road. Speaking of “life on the road,” I am writing this post from an undisclosed location in New Orleans’ French Quarter. Yep – a new road trip has already begun, and here I am still writing about the last one. Stay tuned for more from West Virginia, as well as what is sure to be a whole heck of a lot from this late July/early August jaunt through the Deep South. 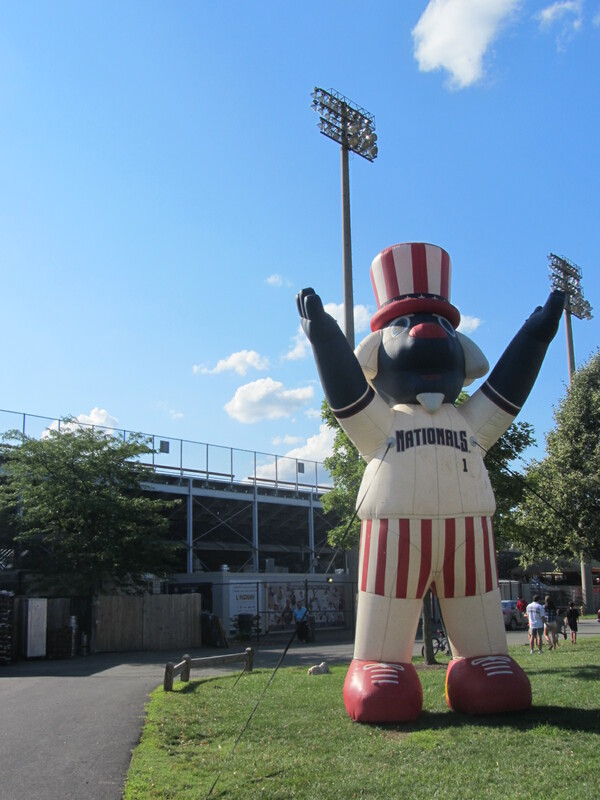 To see all posts from my June 29, 2015 visit to the Potomac Nationals (this is Part Three) click HERE. 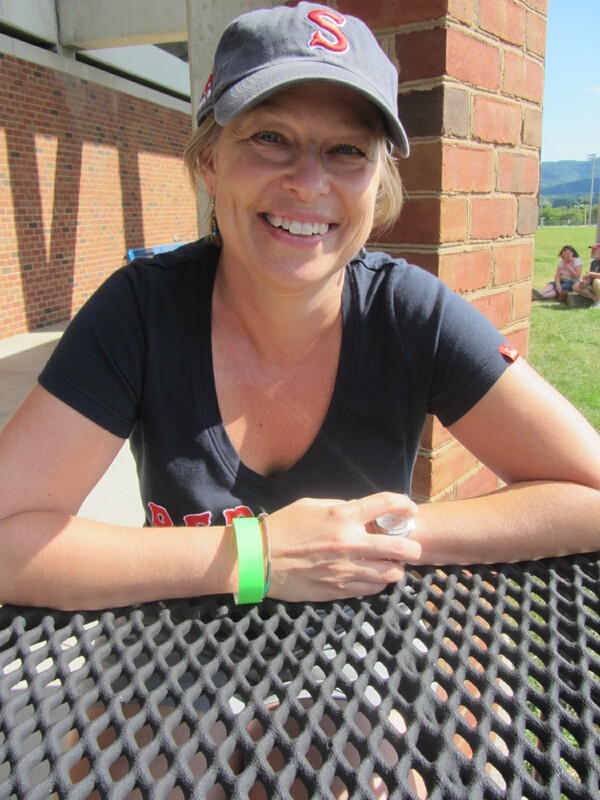 To see all of the posts from my June 2015 trip through the Virginias, click HERE. To see ALL of my “On the Road” posts (going back to 2010), click HERE. Tony’s last name does not have an umlaut, but his name is pronounced as if it was the first two syllables of herbal liqueur Jagermeister (which does have an umlaut). He said that bartenders sometimes give him free shots of Jagermeister, which is good, because it’s not a drink that he likes enough to actually pay for. 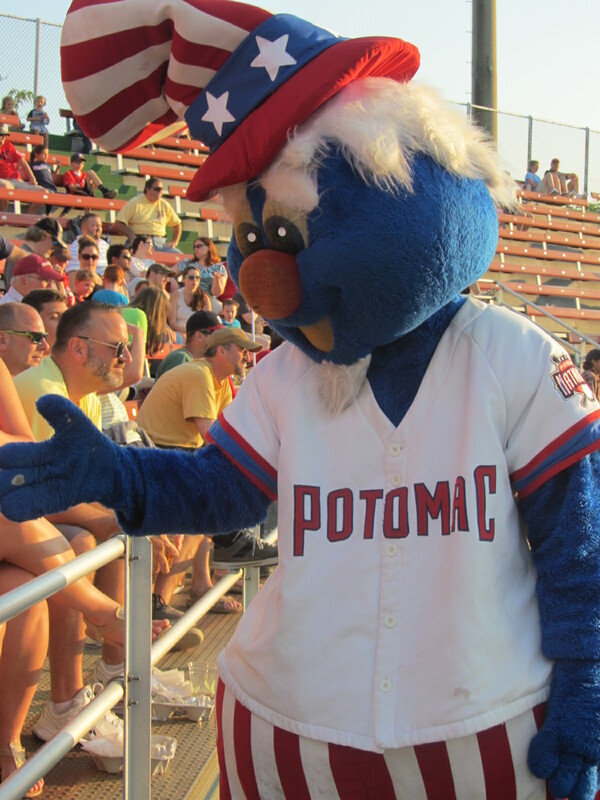 But Tony wasn’t attending this Potomac Nationals game so he could drink, or at least that wasn’t the primary reason. He was attending it so he could eat. 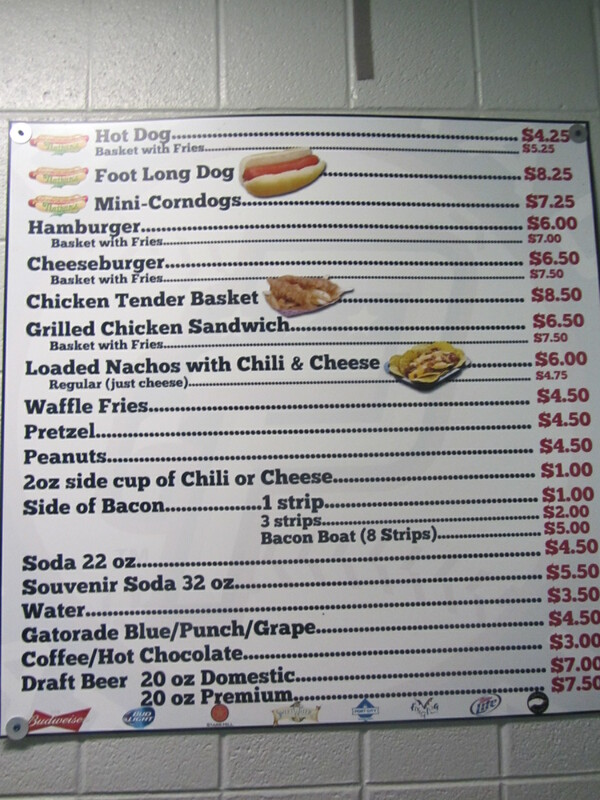 Specifically, he was to serve as my designated eater (you know, the individual who consumes the ballpark cuisine that my gluten-free diet prohibits). 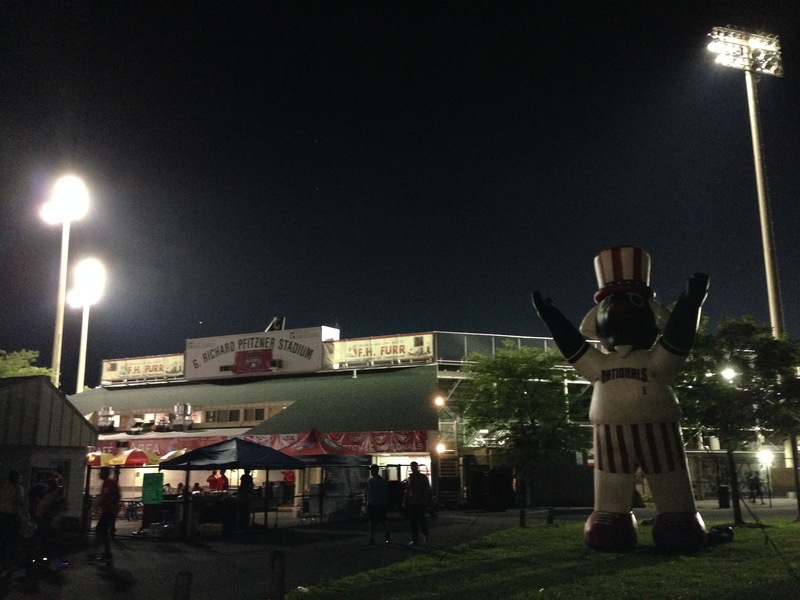 He was joined at Pfitzner Stadium by his girlfriend, Katie. They met on eHarmony, and have been dating for six months. Tony, an El Paso native, lives in Washington D.C. (about a 45-minute drive from “The Pfitz”). He works for a non-profit organization that aids those recovering from addiction, managing the property and also assisting with activities. “I’ve watched him do bingo,” Katie said. Tony and Katie are both baseball fans. 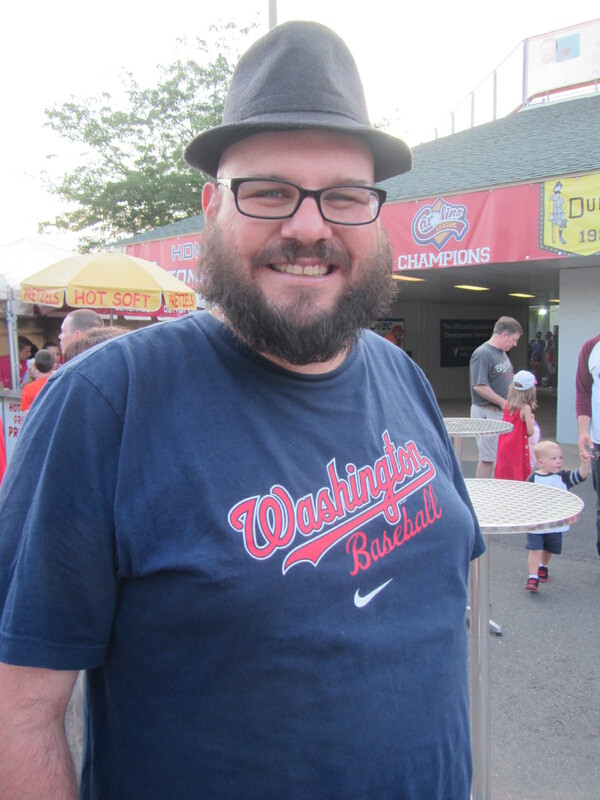 He has a share of a Washington Nationals season-ticket plan, regularly rides his bike to games and follows the team’s affiliates online. Katie, who lives in Annapolis, Maryland, is a Baltimore Orioles supporter. She also supported Tony’s designated eating endeavors. 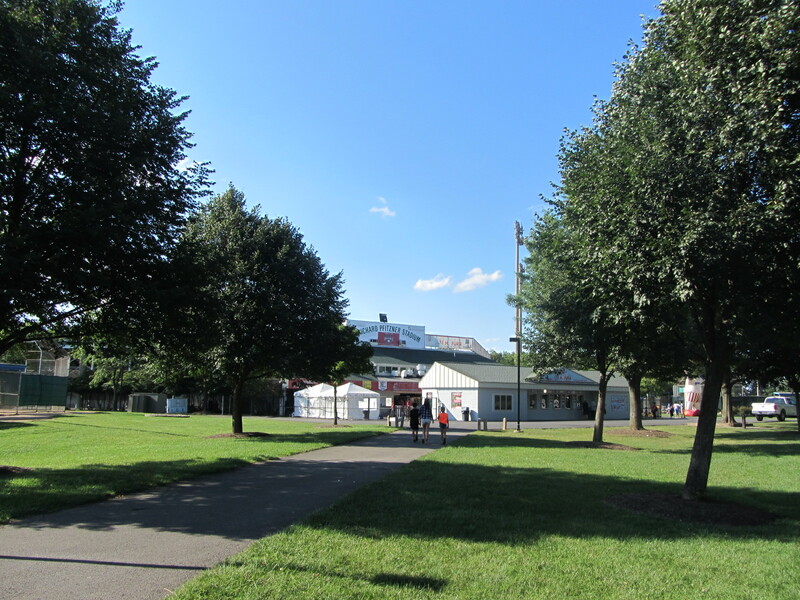 The three of us were standing in the Cafe Area, a concession and picnic area located just past the main entrance. The Cafe Area had a fairly wide-ranging menu, including, yes, a bacon boat. The Cafe Area also had a tremendous line, one so long that I have to show it over the course of two photographs. 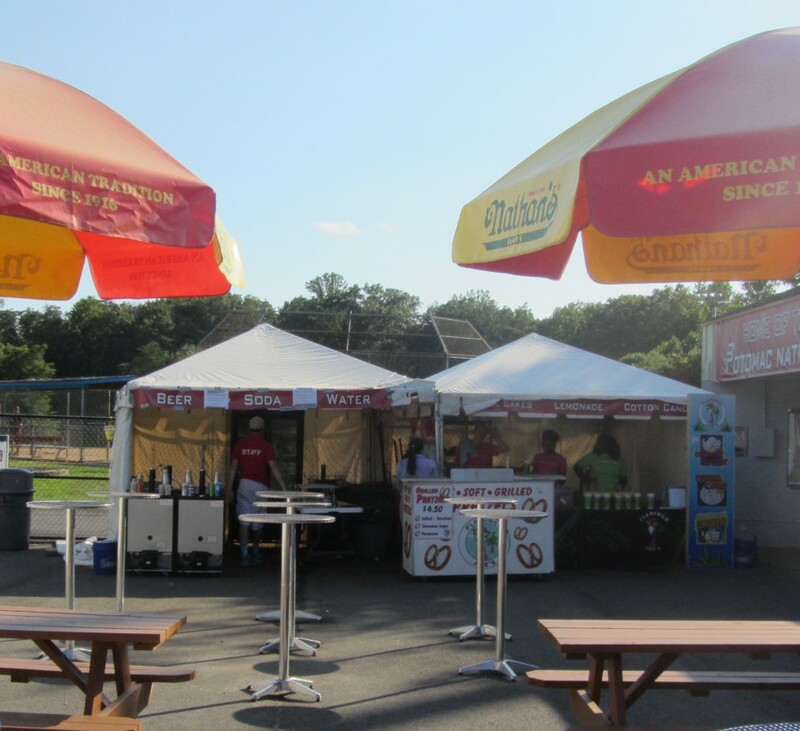 We were in search of “The Codfather,” a fried fish sandwich obtainable at the tent on the left. There was no line to speak of at this tent, thank goodness. The mighty Ben’s Biz does not deign to wait in lines. “Let’s look for the enigmatic,” it says in my notebook. I’m not sure who said that, but it captures our collective spirit at that moment. 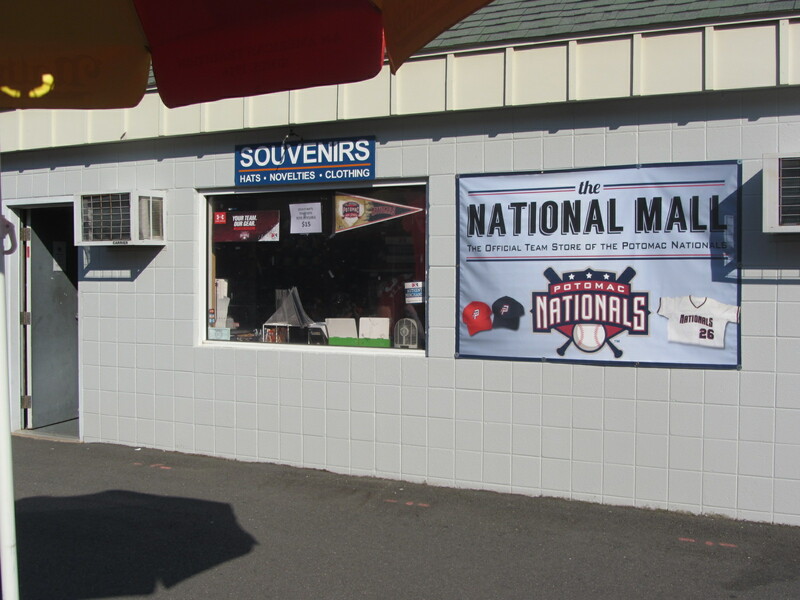 Specifically, we were looking for the enigmatic “National Burger,” which had been suggested earlier in the evening by P-Nats general manager Josh Olerud. But where could this burger be obtained? It wasn’t in the Cafe Area and it wasn’t in the same tent location in which we had located the Codfather. As we bravely plunged into the crowded concourse area, our fates uncertain, I heard a voice call my name. 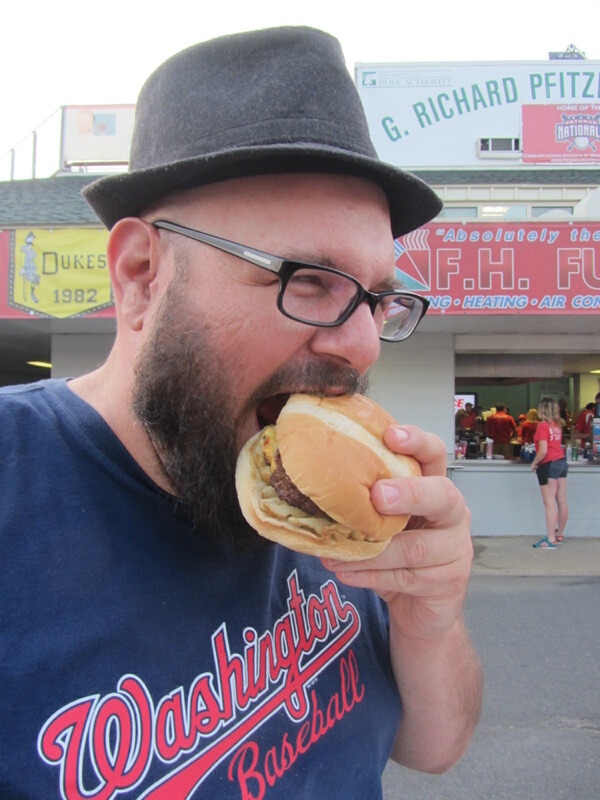 It was P-Nats food and beverage manager Aaron Johnson, and in his hand was the mysterious National Burger. The enigmatic had been located, and all was right with the world. 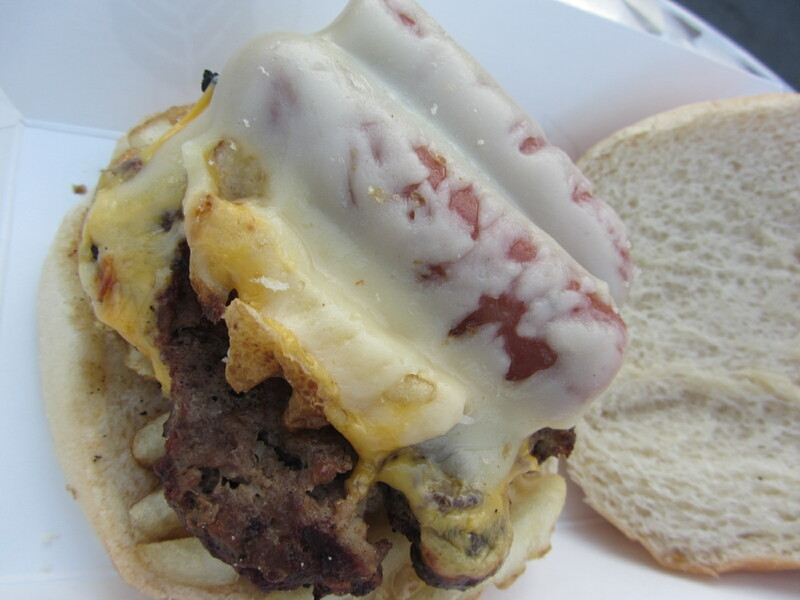 Johnson explained that the National Burger consisted of a pub burger topped with two slices of American cheese (one white and one yellow) and a Nathan’s hot dog. Beneath the burger, serving as the base, was a layer of french fries. “Since our team name is the Nationals, we figured we’d do something all-American,” Johnson said. Tony wasted no time getting down to business. And with that, Tony had completed his designated eating duties. 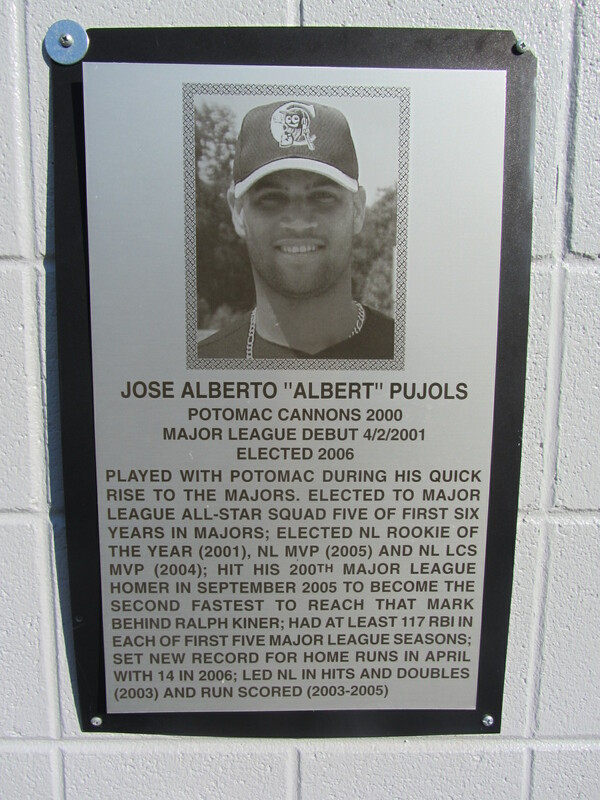 He and Katie were free to return to their seats, which were located right behind home plate (courtesy of the P-Nats). 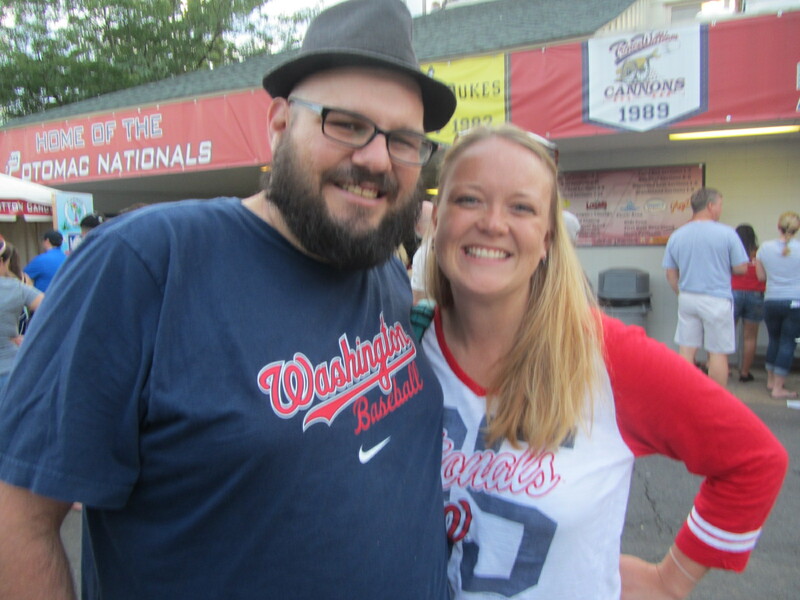 To see all posts from my June 29, 2015 visit to the Potomac Nationals (this is part two) click HERE. To see all of the posts from my June 2015 trip through the Virginias, click HERE. To see ALL of my “On the Road” posts (going back to 2010), click HERE. I’m running out of ways to introduce the second part of a blog post series. 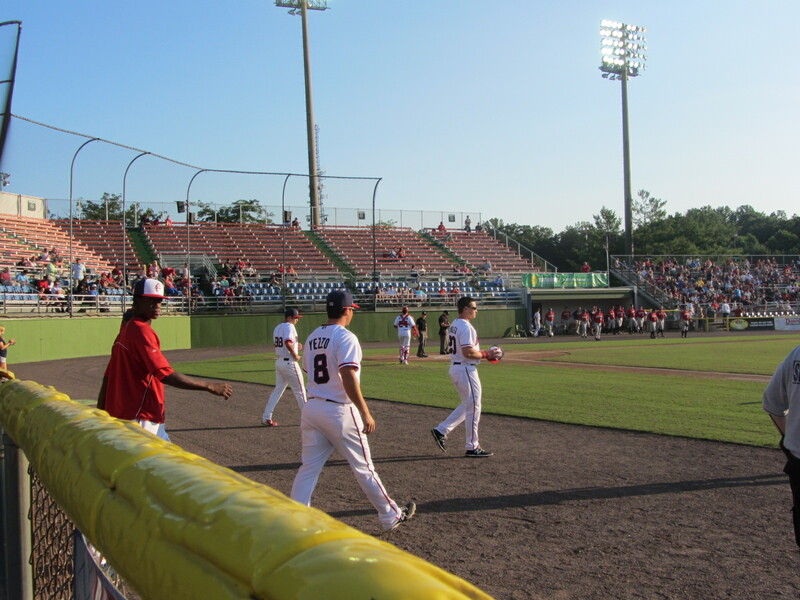 It almost always begins at the start of the ballgame, and this post is no exception: A baseball game had just begun; specifically a Carolina League contest between the Potomac Nationals and visiting Carolina Mudcats at G. Richard Pfitzner Stadium. As mentioned in the previous post, this is a stadium that faces west to a degree that is less-than-ideal. It was a Monday, but it wasn’t just any Monday. 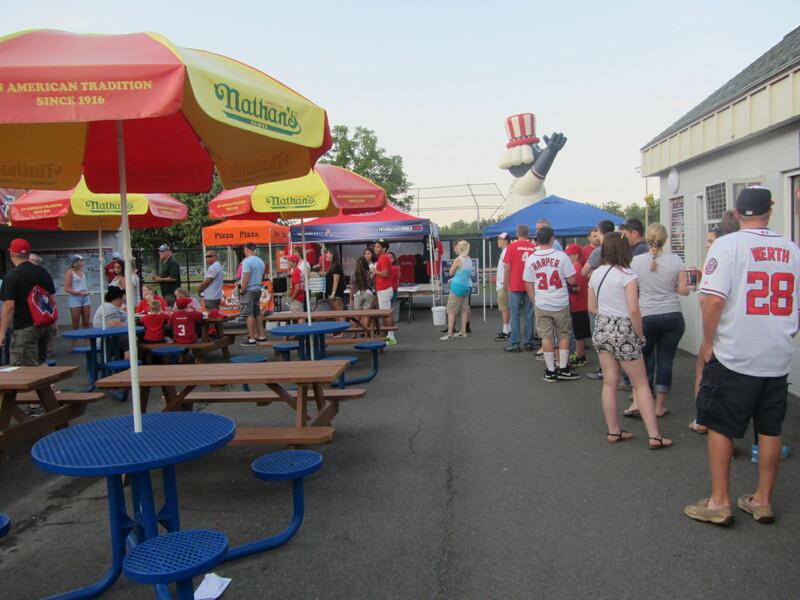 It was Dollar Monday — $1 general admission tickets and $1 hot dogs. 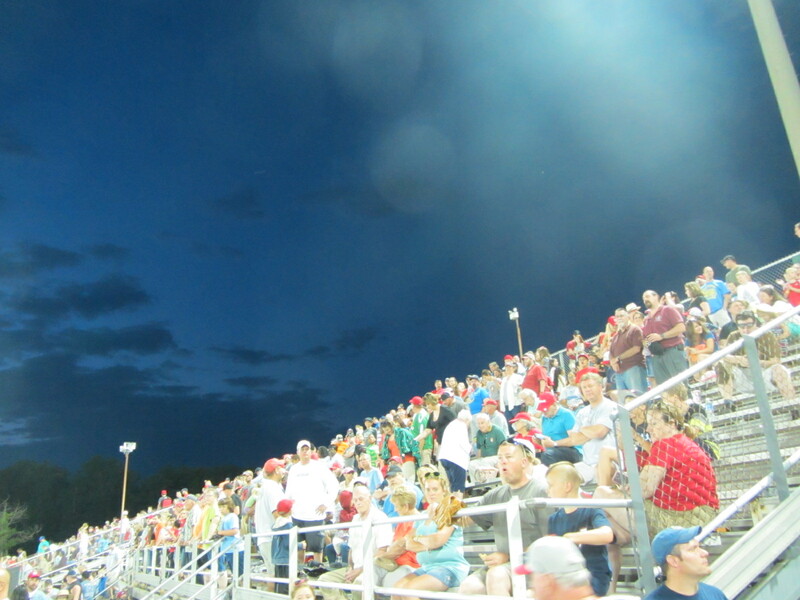 This led to a much larger crowd than I was expecting, which was later announced at 5,137. The concourse can barely accommodate such a robust group of buck wiener seekers. Among the fans in attendance was Todd Headington, who asked for a photo and later tweeted the following. This is the first time I’ve ever been called a “MiLB Hero” and, yeah, I’m bragging about it. 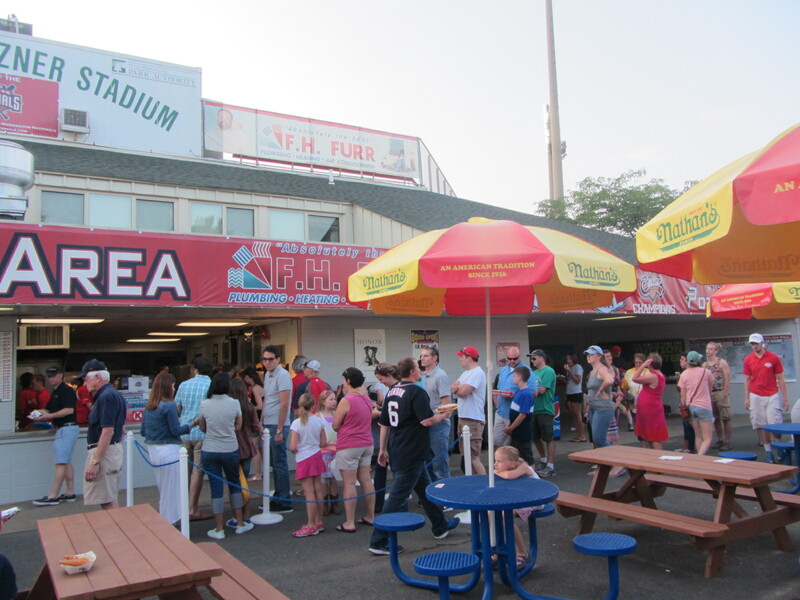 Ken’s Place [is] a standing-room-only gathering spot identified by a banner hanging on a chain-link fence that runs down the first base line. It has the atmosphere of a local watering hole, a largely male enclave where everybody seems to know everybody else. Within this convivial locale, the trash talk, in-jokes and beer flow freely. 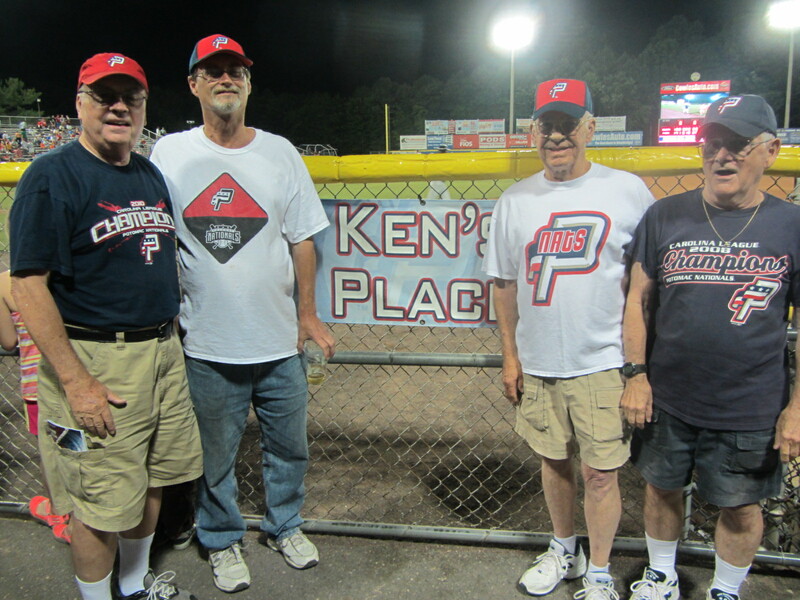 Ken’s Place is a longstanding tribute to die-hard P-Nats fan Ken Rostkowski, a mainstay at “The Pfitz” who passed away suddenly in 2007 at the age of 46. During my visit to Ken’s Place, something hilarious happened. For some reason, or perhaps no reason, Cookie Monster tackled Uncle Slam during a between-inning race. Uncle was Slammed to the ground, and his head popped off. 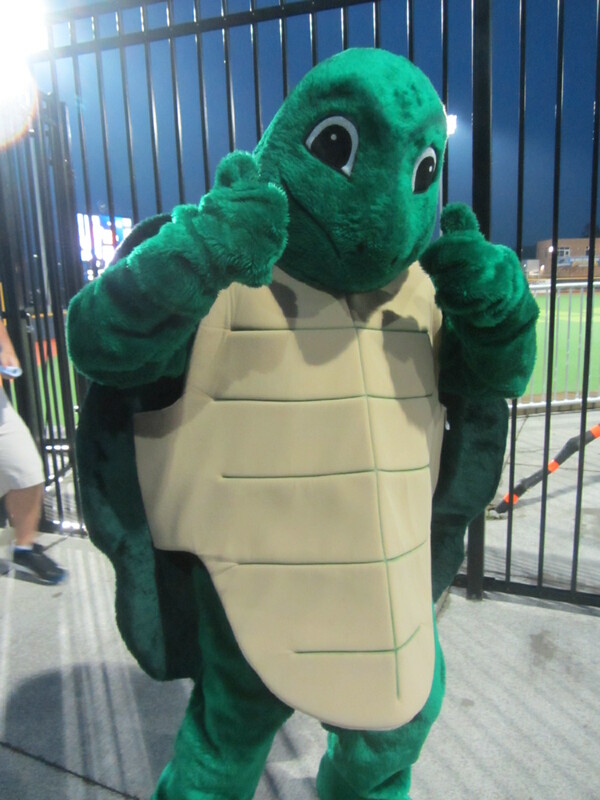 I understand that headless mascots are one of Minor League Baseball’s biggest taboos, but as a conscientious journalist I have no choice but to share. Moving on to a less-controversial topic, it was still a beautiful night! In fact, it just kept on getting more beautiful. 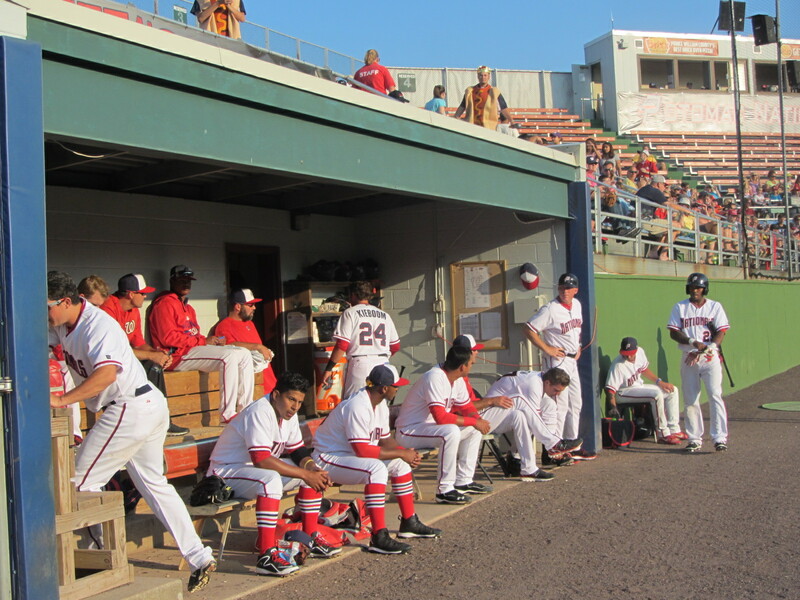 The P-Nats went on to secure a 7-2 victory over the Mudcats of Zebulon, North Carolina. 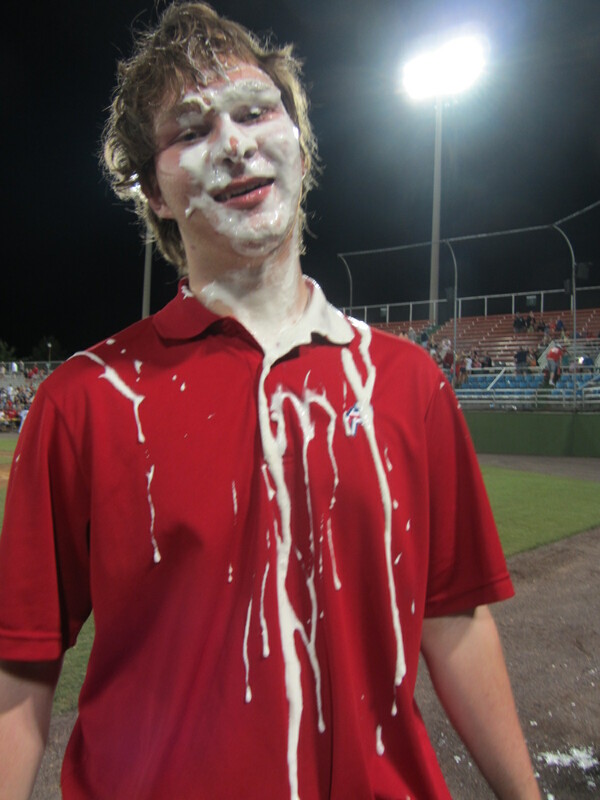 But even more importantly, some interns won the Intern Olympics and some interns lost the Intern Olympics and therefore some of the winning interns hit some of the losing interns in the face with a pie of some sort. There’s not much that can be done after that, except maybe toss a few tennis balls in the direction of various on-field targets. Well, actually, there was still one more thing to do. These jokes don’t write themselves. Good night from the Pfitz. 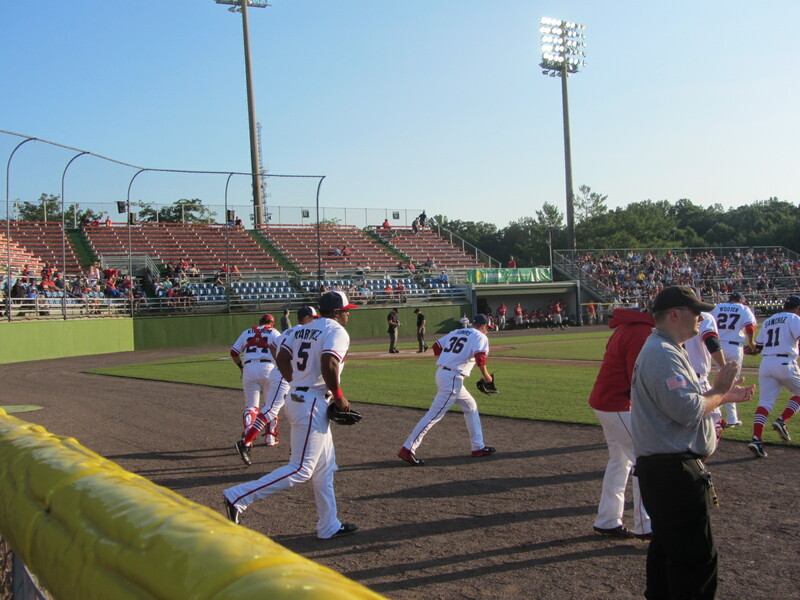 To see all posts from my June 29, 2015 visit to the Potomac Nationals (this is Part One) click HERE. To see all of the posts from my June 2015 trip through the Virginias, click HERE. To see ALL of my “On the Road” posts (going back to 2010), click HERE. The Pfitz is located in Woodbridge, Virginia, part of the greater Washington D.C. area. Driving in this heavily congested area gives me Pfitz, but I allotted myself plenty of time to make the trip from Salem and made it to Woodbridge uneventfully. 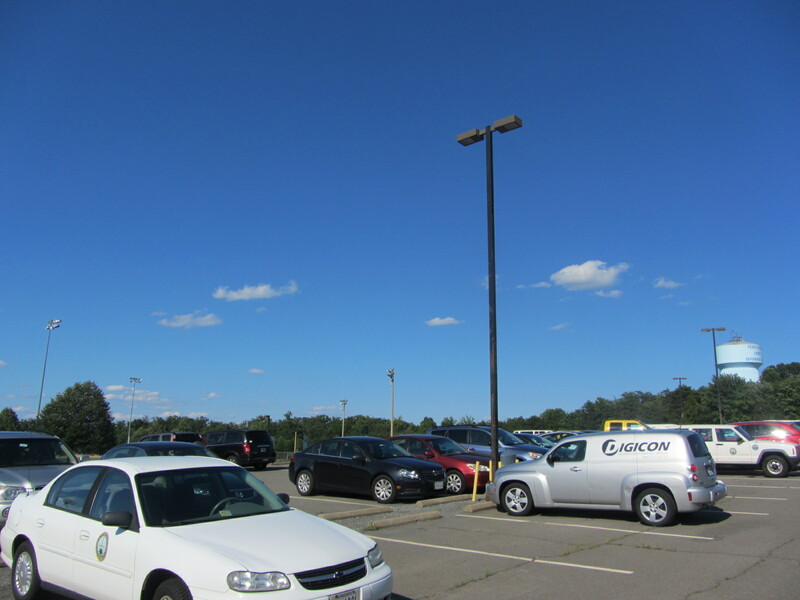 After arriving at the listed alliterative address of 7 County Complex Court, I parked my car in a lot largely occupied by Prince William County government vehicles. After changing my shirt (yep, yet another instance of stadium parking lot toplessness), I looked around and was at first confused as to where the stadium actually was. Ah, yes, there it is. The Pfitz opened in 1984, and has not aged all that Orwell. 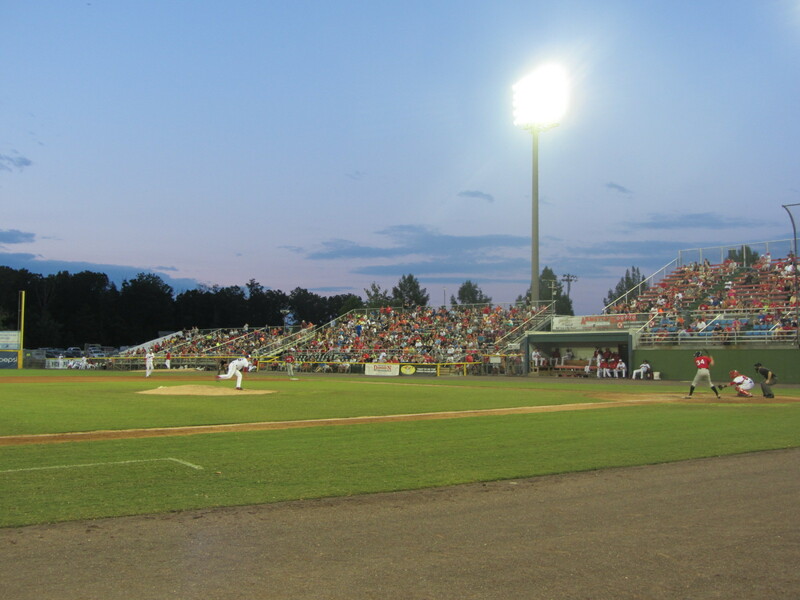 P-Nats owner Art Silber has been working for years to finance a new stadium, an effort I covered in some detail during the offseason, and its days appear to be numbered. 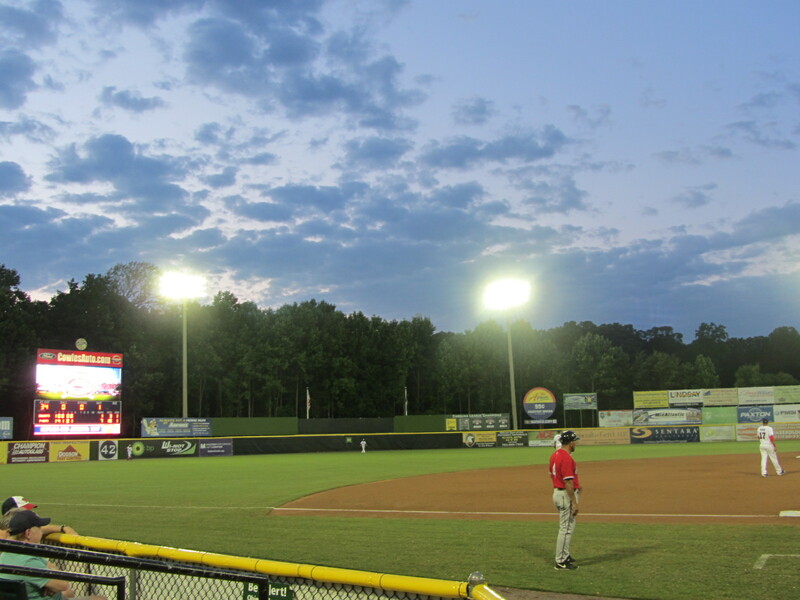 But despite the long-articulated deficiencies of this no-frills Carolina League facility, I was immediately charmed by it. Uncle Slam wants you to, per industry operating principles, enjoy an evening of affordable family-friendly fun. 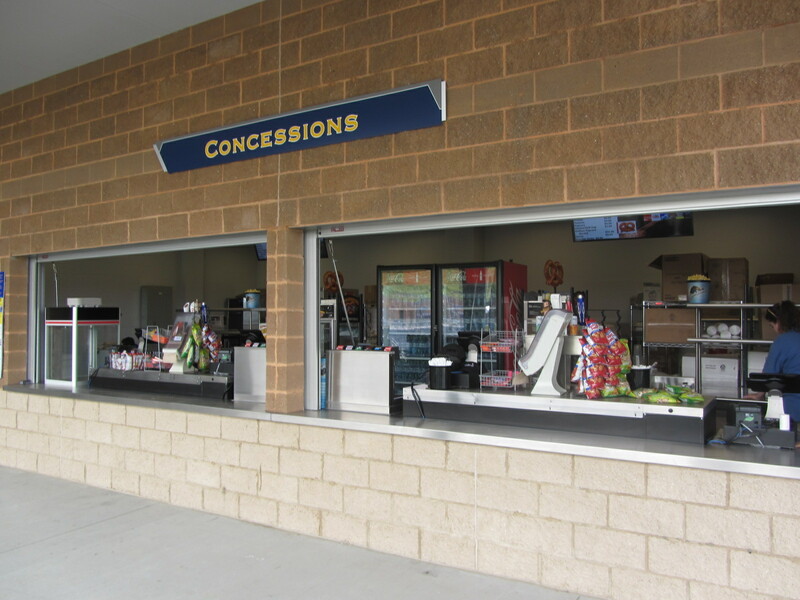 The main entrance of the stadium leads directly into the Cafe Area. The Cafe Area is locked in an unending staring contest with “The National Mall” team store. 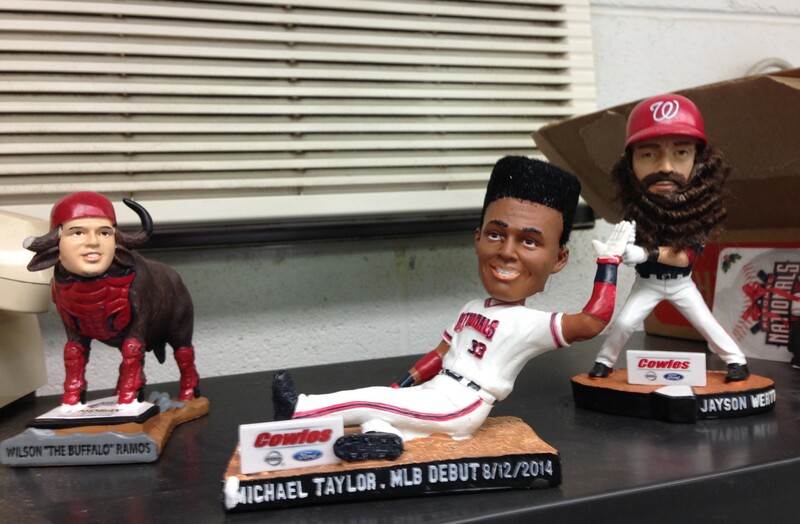 In the adjacent ticket office, I became acquainted with a triumvirate of recent P-Nats giveaway items: Wilson “The Buffalo” Ramos, Michael Taylor Flattop figurine and the Jayson Werth Beard-A-Rine. All of them make perfect sense and do not need to be explained. To the right of the team store is a franchise Hall of Fame, which features some pretty big names. We now transition from big names to a small concourse. But the front office still finds ways to be creative within these confines. 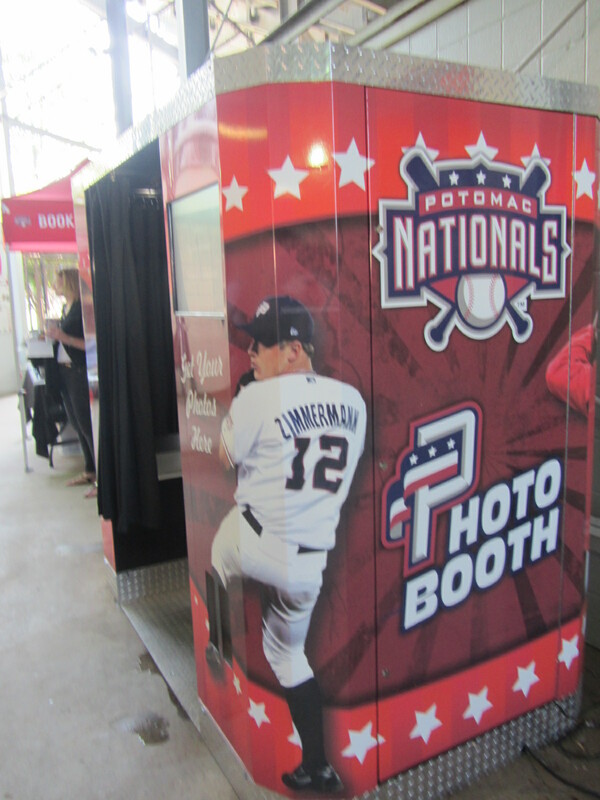 I’d never seen a photo booth at a Minor League ballpark before, and think it’s a great idea. 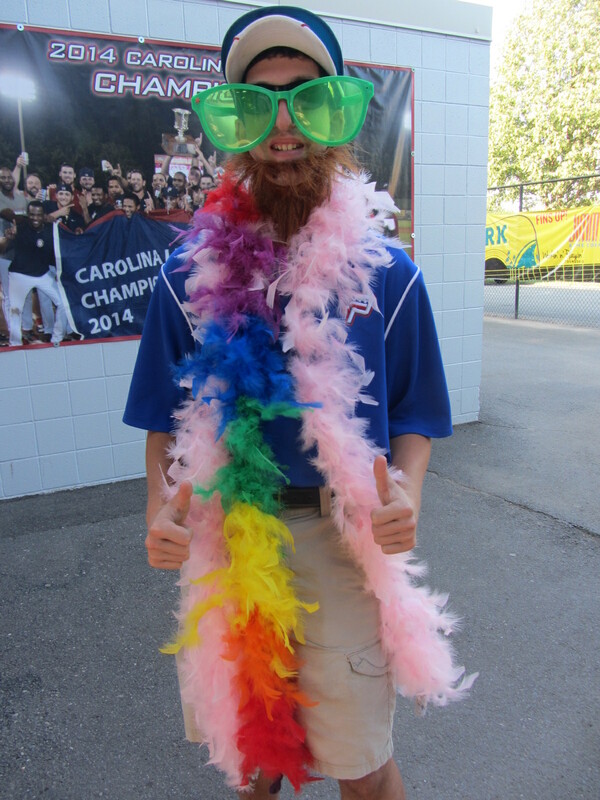 I soon ran into Andrew Pollowitz, recent Lynn University graduate and P-Nats intern. Pollowitz doesn’t dress like this every game, or at least I don’t think he does. 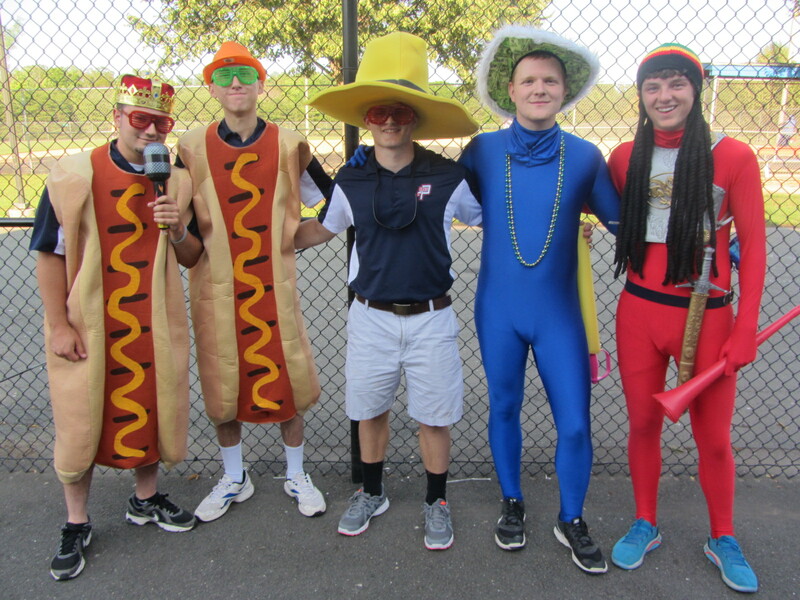 The P-Nats were staging the “Intern Olympics” on this Monday evening, an event of great pomp and pageantry that required costumes such as the above. Weiners could be seen everywhere. Finally, mercifully, I made it out onto the field of play. 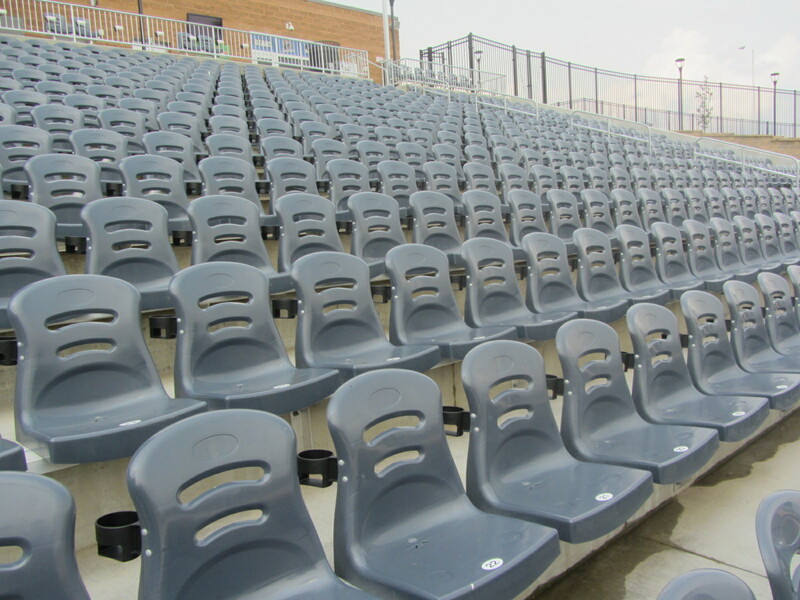 The Pfitz is a minimalist amalgam of seats and bleachers. 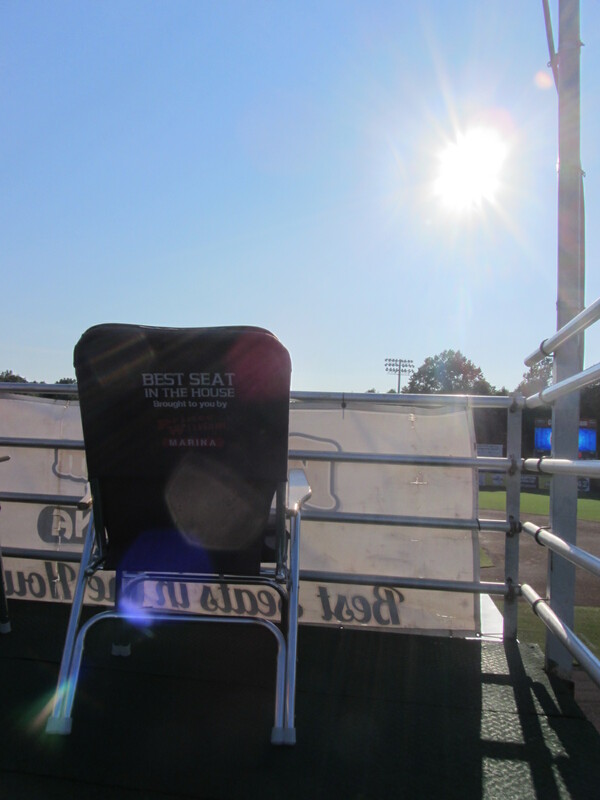 This, allegedly, is the best seat in the house. 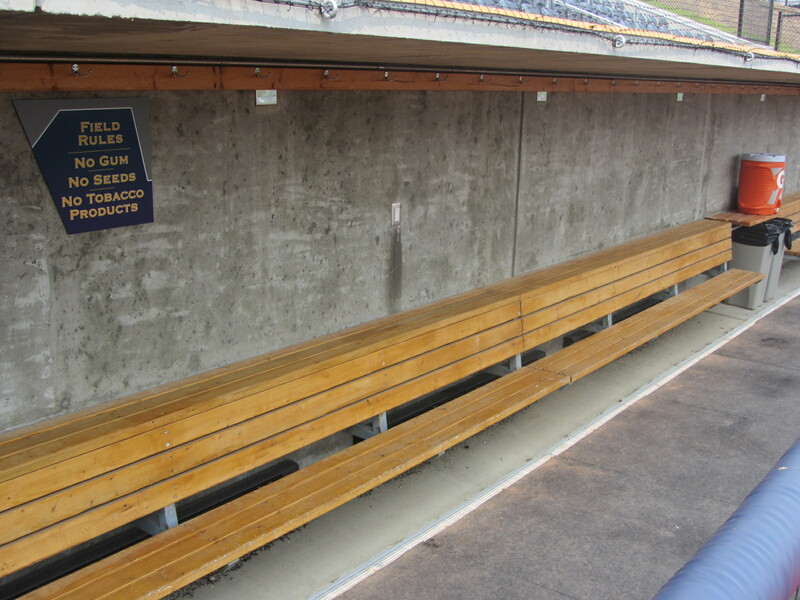 Here, we see a rare living example of the non-descending dugout. It was a beautiful day for baseball. That’s all I ever ask for. There is little relief from the sun, however, a situation that is exacerbated by the Pfitz’s less-than-ideal orientation. It’s not at Bakersfield (or even Batavia) facing-the-sun levels, but still pretty bad. The start of the game was still more than half an hour away. Thus, it was an ideal time to conduct an interview. 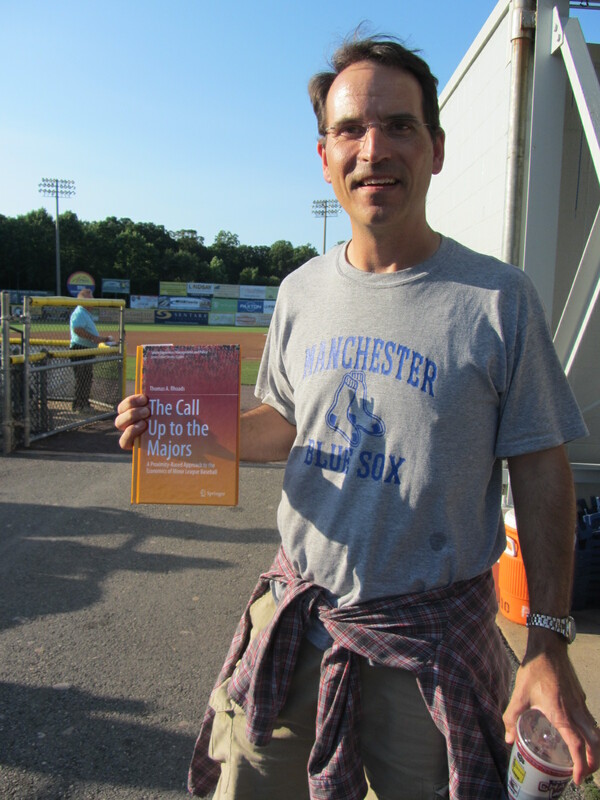 This, here, is Thomas J. Rhoads, a Towson University professor and author of the recently-published The Call Up to the Majors: A Proximity-Based Approach to the Economics of Minor League Baseball. This book explores the unique relationships between professional baseball teams and the unique ways professional baseball teams are organized in North America with a primary focus on how proximity can and does impact consumer demand. After taking the photo of Thomas seen above, I turned to my right and found myself in proximity to this quintessentially Minor League Baseball tableau. Okay, enough stall-ing, it was time for the game to begin. The starters hustled out onto the field for the National Anthem. While the reserves took their sweet old time. 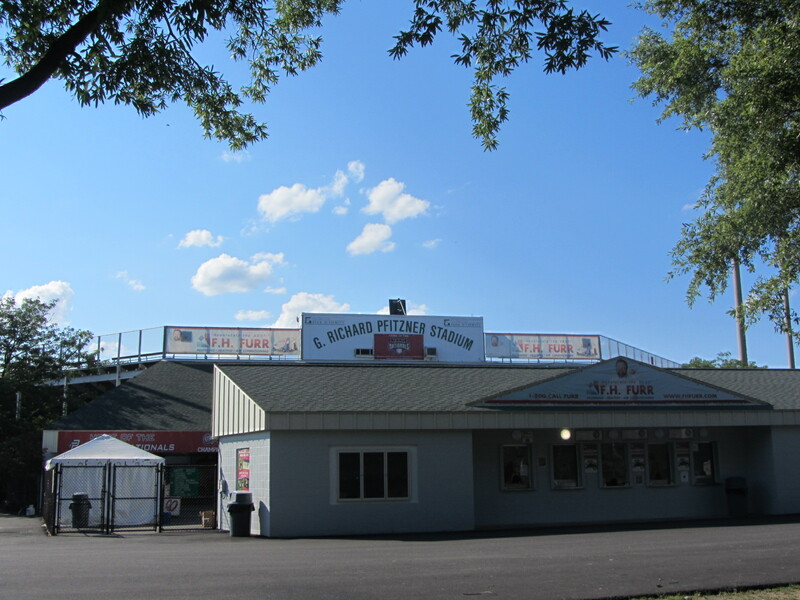 To see all posts from my June 28, 2015 visit to the Salem Red Sox (this is Part Three) click HERE. To see all of the posts from my June 2015 trip through the Virginias, click HERE. To see ALL of my “On the Road” posts (going back to 2010), click HERE. We have now reached the third and final post in this Salem series and, if you’ve been following along so far this season, then you know that the third and final post is, invariably, dedicated to food. 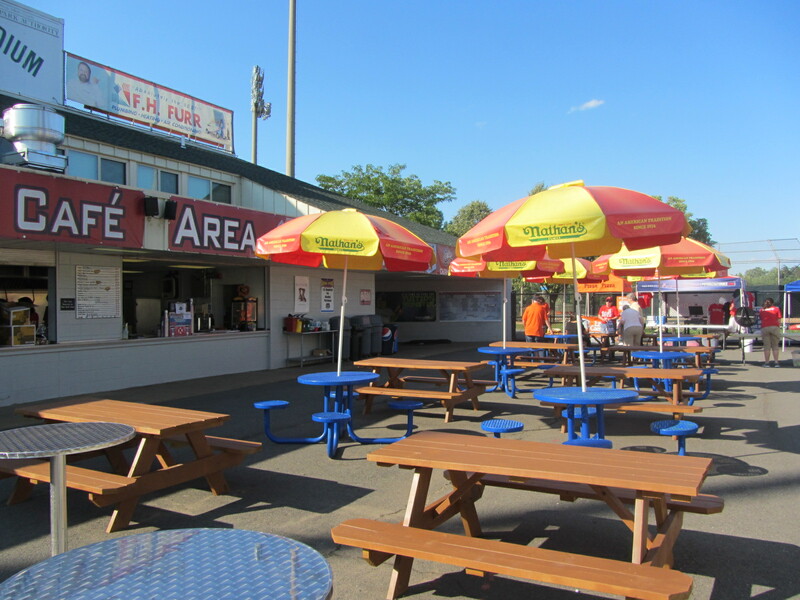 So what kind of concession items can you get at the Salem Red Sox’s home of Lewis-Gale Field? We’ll get to that in a moment. I want to start, however, by highlighting something that you can sometimes get (but not on the Sunday afternoon in which I was in attendance): Baum’s BBQ truck, a vehicular food purveyor with an exalted reputation, sets up shop every Friday and Saturday night. 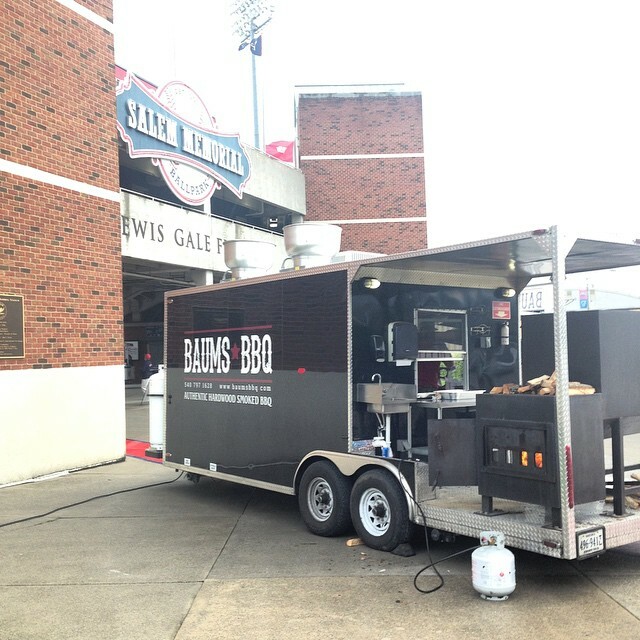 But, Baum’s or no Baum’s, the Salem Red Sox food show must go on. 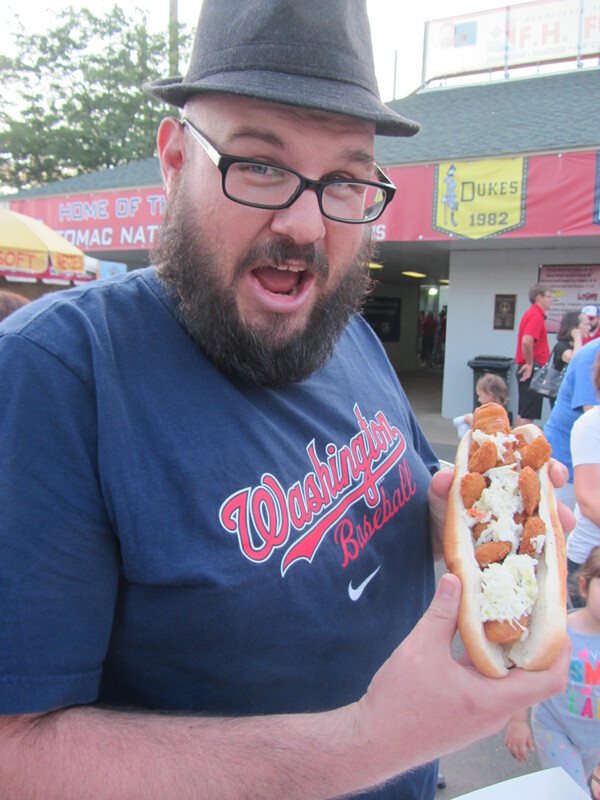 The first order of business, as always, was to meet with my designated eater (you know, the individual who consumes the ballpark food that my gluten-free diet prohibits). At Lewis-Gale Field, that would be one Jennifer Frye. Fair enough, kids. But I guarantee that, when all is said and done, your childhood will have been greatly enhanced by having a Mom with a fun, adventurous and humorous spirit. This spirit was shared by the entirely non-embarrassed adults in Jennifer’s party — husband Jim, sister Justine, and her sister’s husband Jonathan (Justine and Jonathan live outside of Frederick, Maryland, reminding me that I have yet to make it to a Keys game). 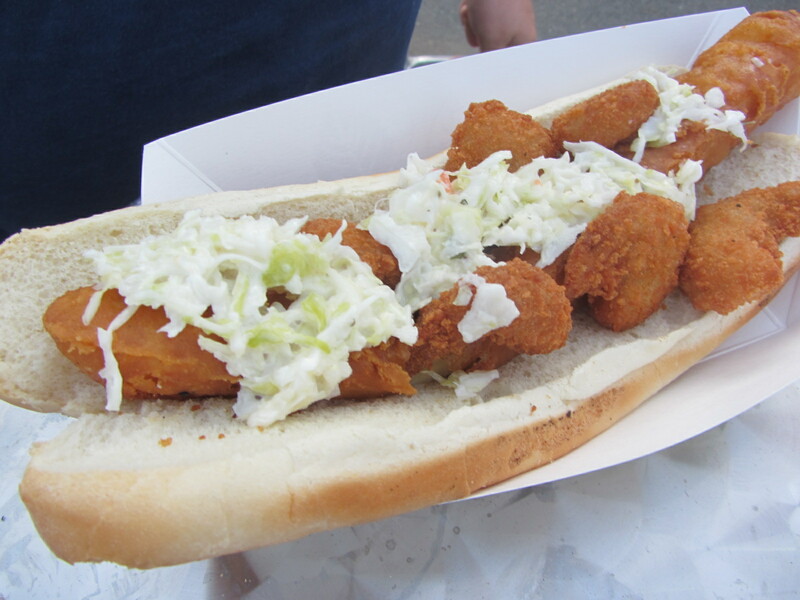 We began at Swine Drive Deli Dawgs, which offers a wide array of specialty frankfurters. 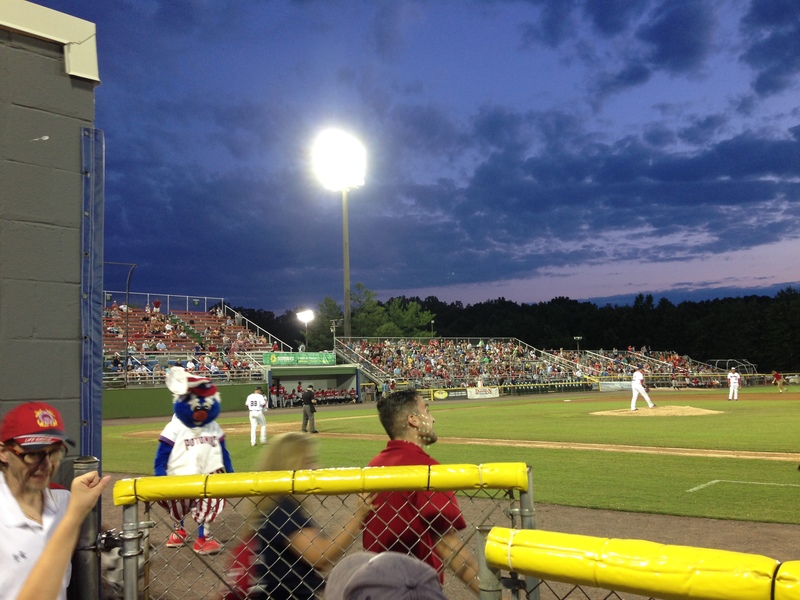 To see all posts from my June 28, 2015 visit to the Salem Red Sox (this is Part Two) click HERE. To see all of the posts from my June 2015 trip through the Virginias, click HERE. To see ALL of my “On the Road” posts (going back to 2010), click HERE. 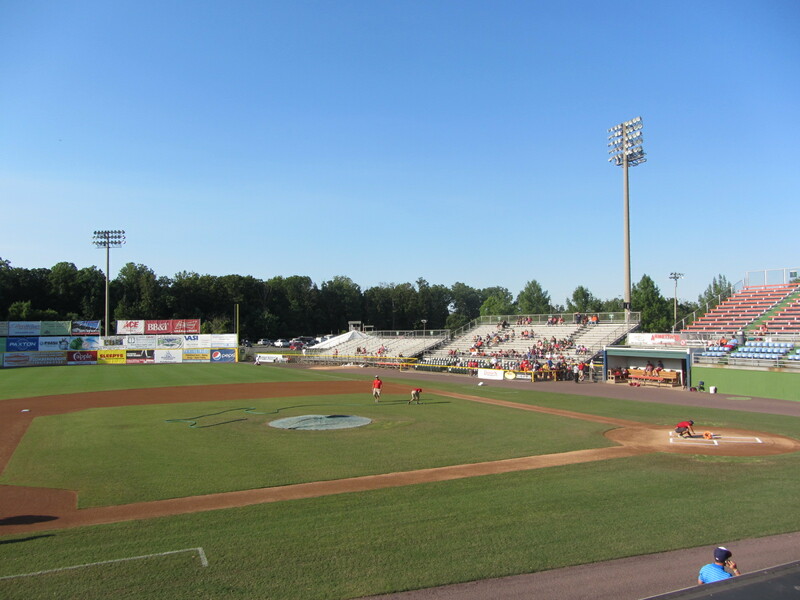 As part one of this blog series concluded, a ballgame was ready to begin on a beautiful Sunday afternoon in Salem, Virginia. Now, as we begin part two, the ballgame has just begun. These narrative stakes, they just keep escalating. 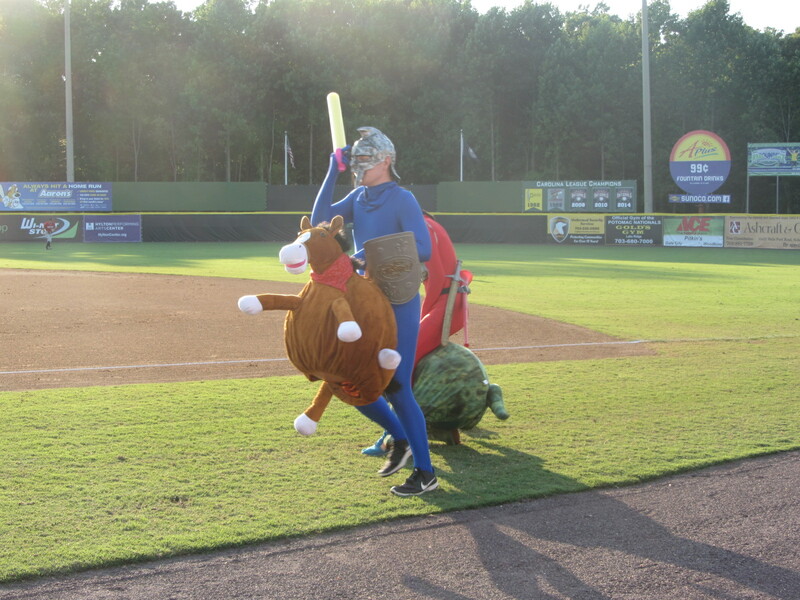 The first batter of the ballgame was Lynchburg’s Luigi Rodriguez, who was greeted with the Super Mario Bros theme music. Rodriguez must have just ingested mushrooms, however, as he powered up and launched the first pitch of the game over the fence. 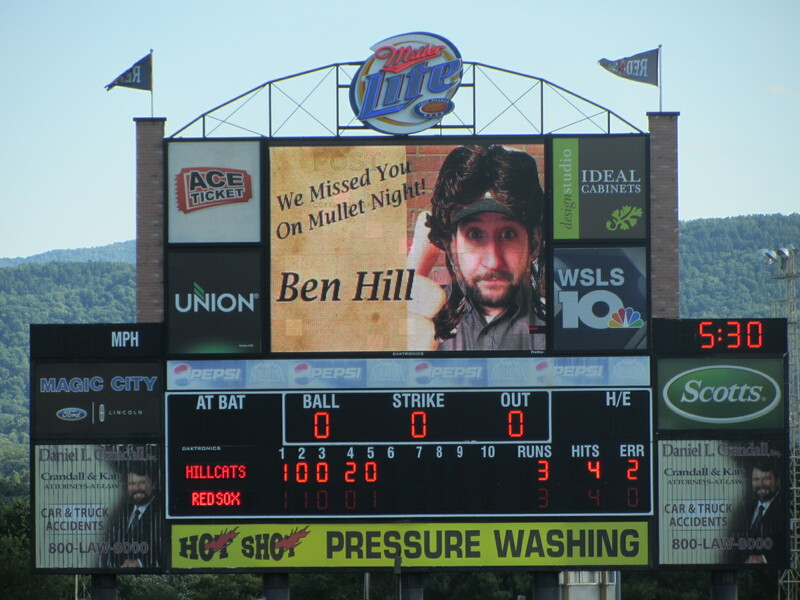 And just like that, the Hillcats had the lead. Rodriguez’s dinger just about fulfilled my baseball-watching quota for the day, so I commenced upon more ballpark wanderings. First up was a meeting with my designated eater. Following standard operating protocol, that will be documented in the following post. Stay tuned. 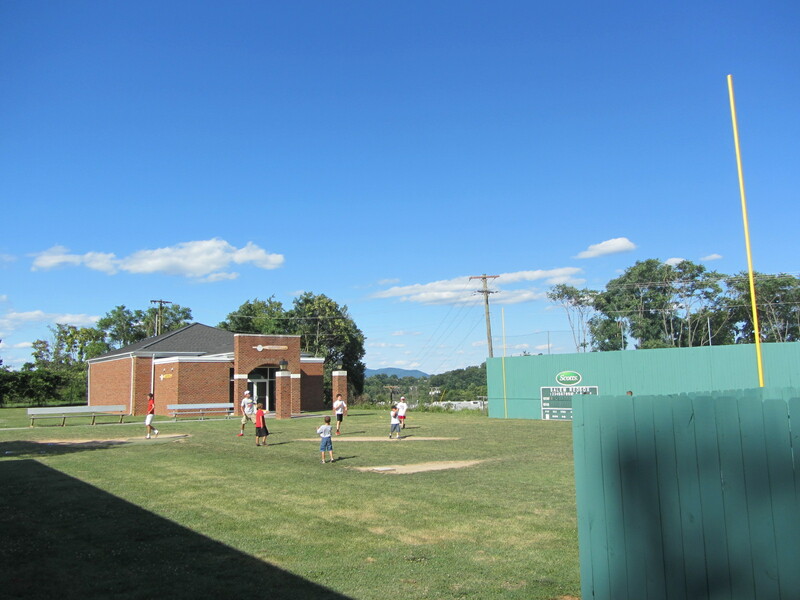 …and at the adjacent Mini-Fenway Wiffle ball field. 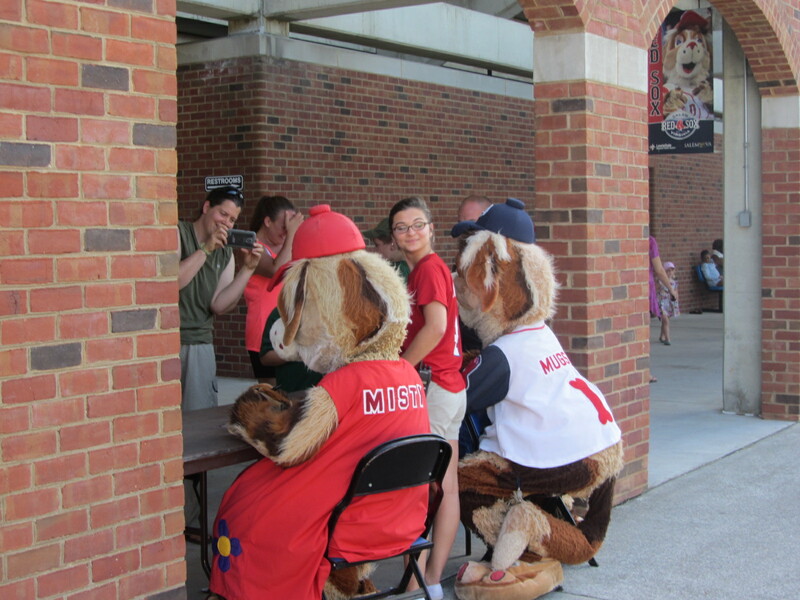 It was also a beautiful day for collecting autographs from a canine mascot duo. You know, if you’re into that sort of thing. That’s Misty on the left, and Mugsy on the right. I was glad that I hadn’t missed Misty, but I had missed the previous evening’s “Mullet For Men’s Health Night” promotion. I appreciate the team’s effort to make me feel included on this front (don’t touch the back).